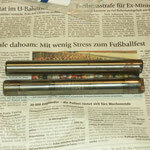 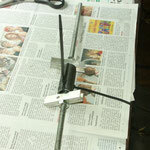 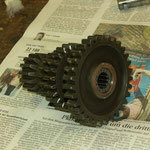 16th of June 2012: Transmission is finished! 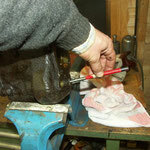 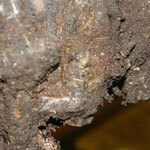 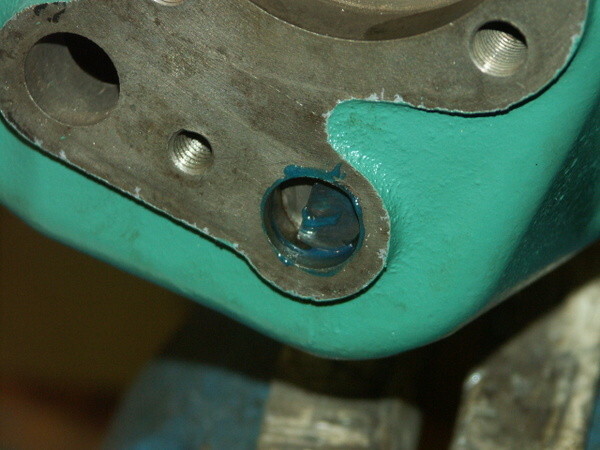 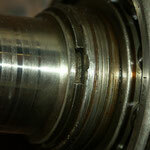 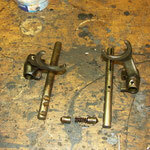 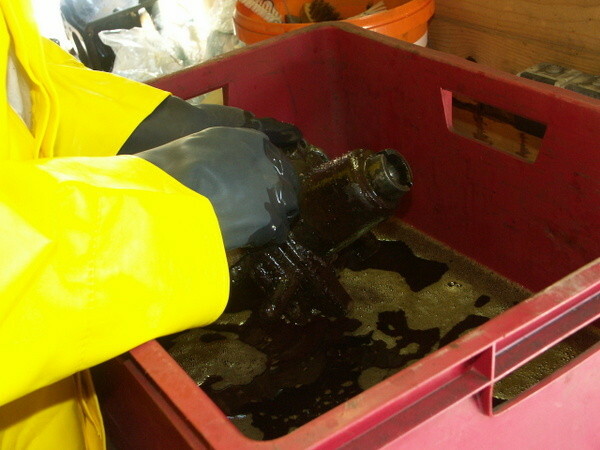 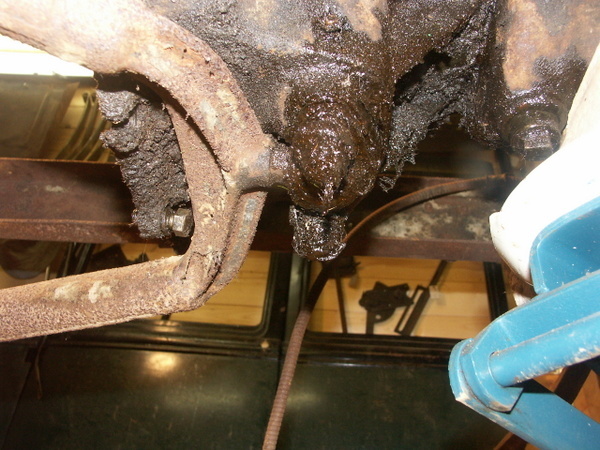 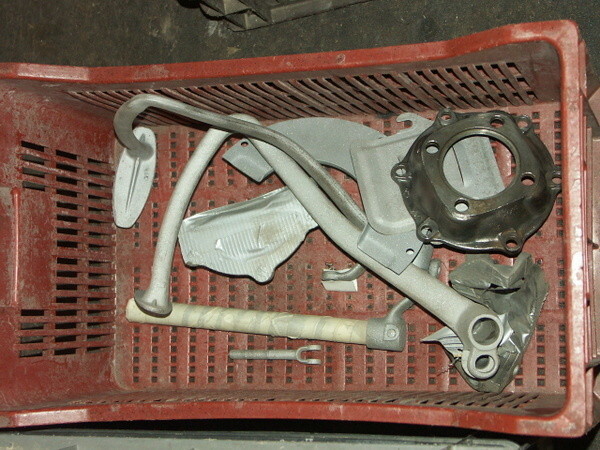 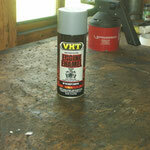 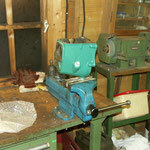 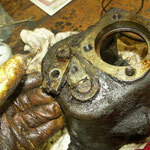 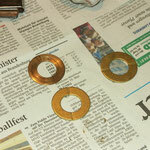 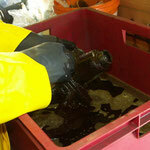 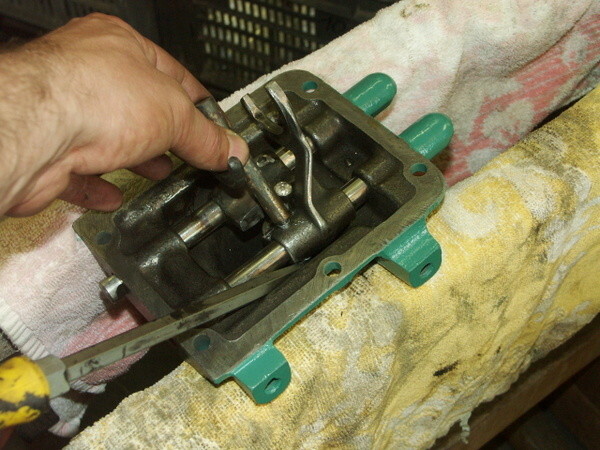 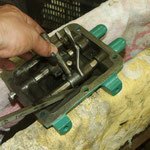 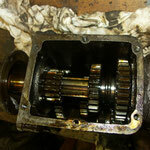 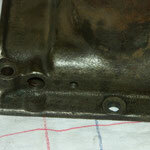 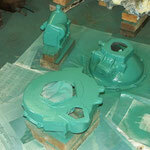 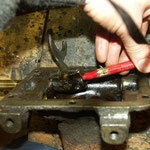 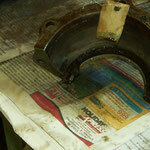 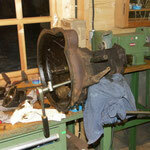 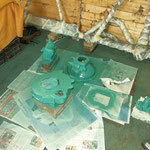 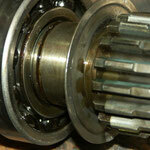 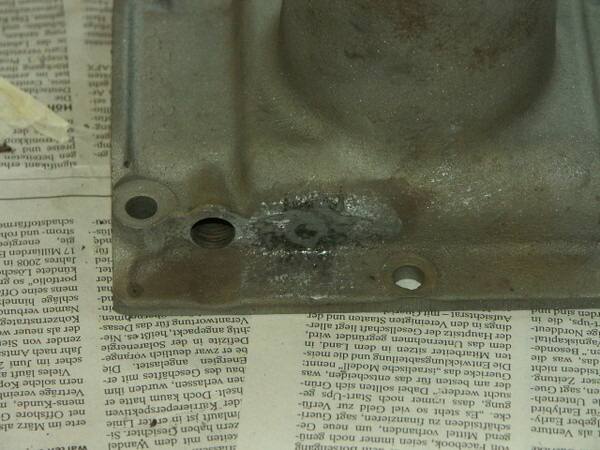 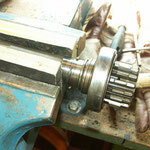 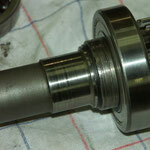 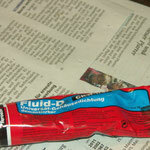 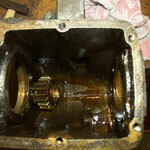 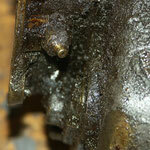 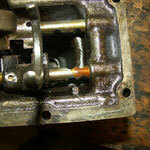 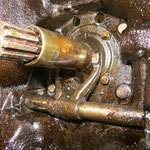 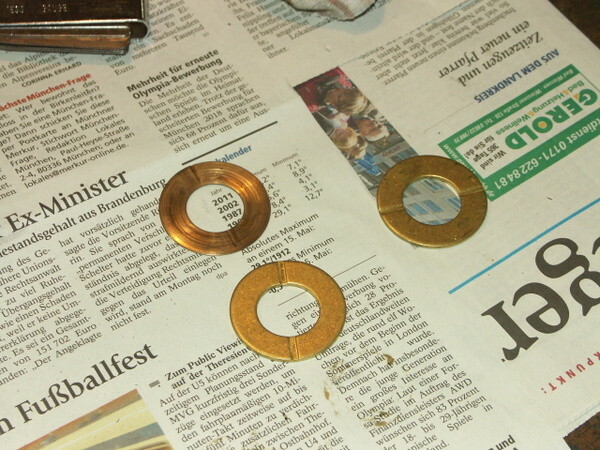 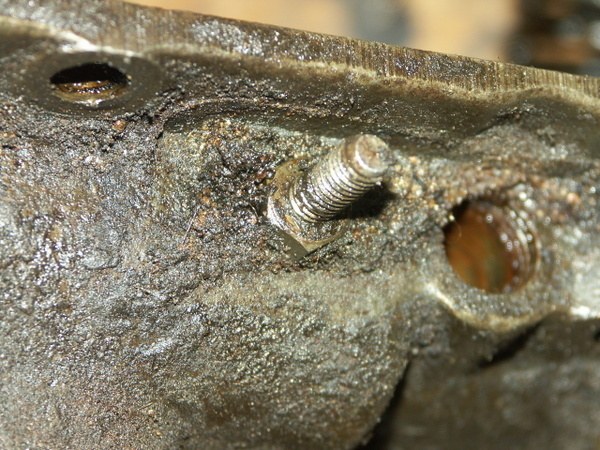 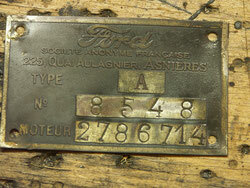 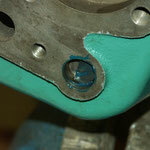 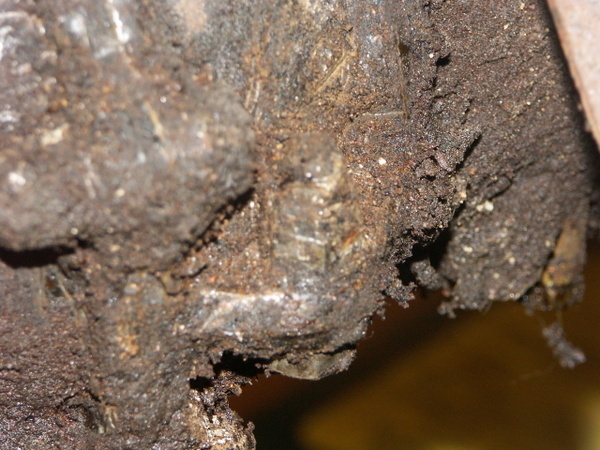 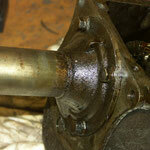 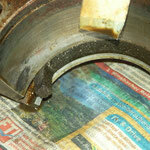 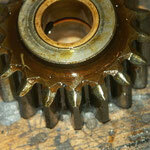 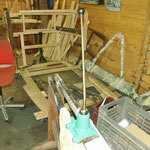 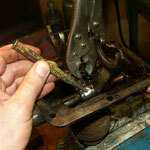 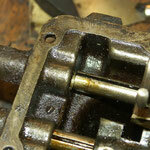 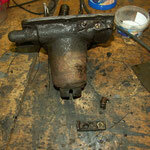 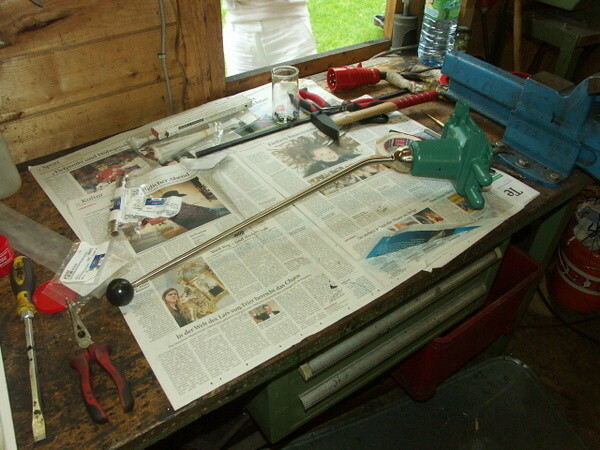 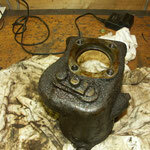 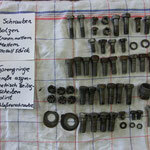 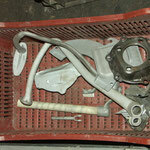 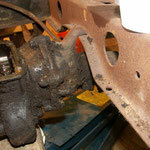 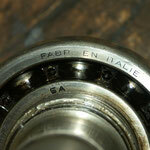 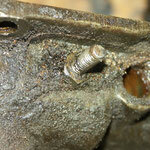 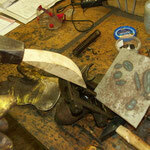 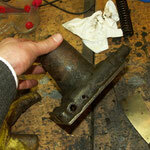 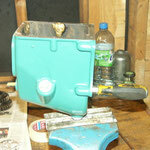 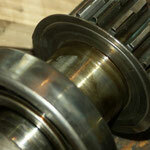 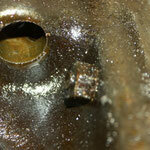 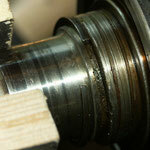 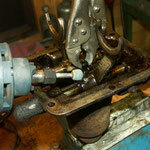 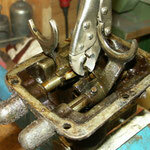 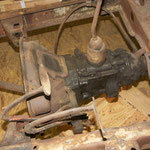 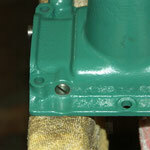 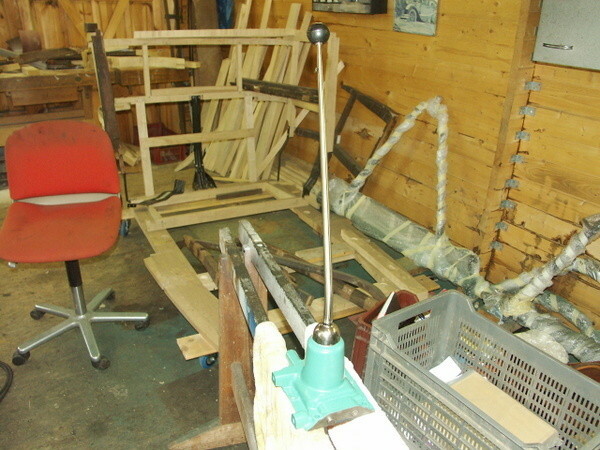 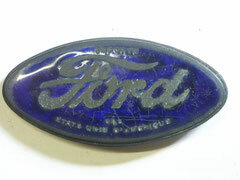 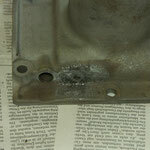 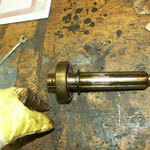 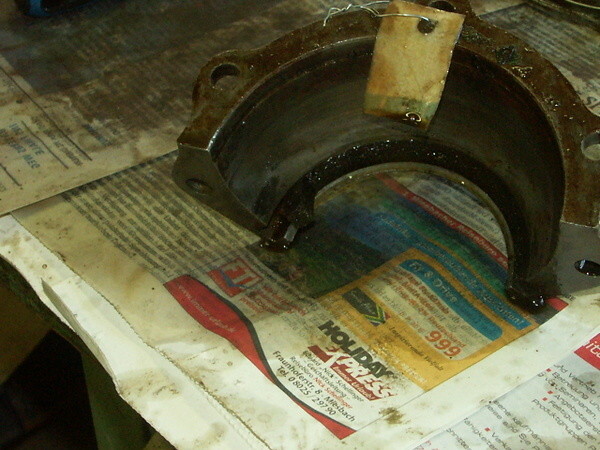 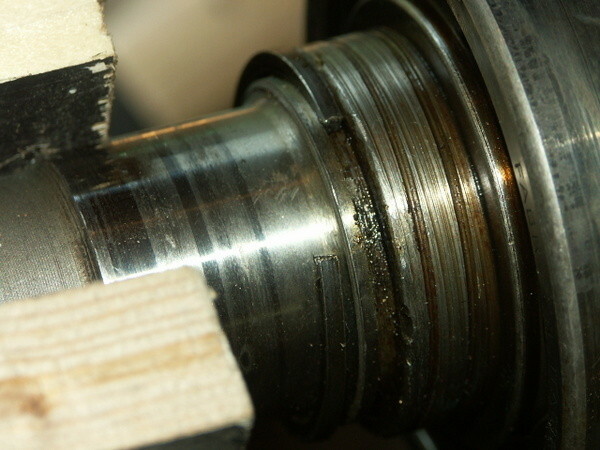 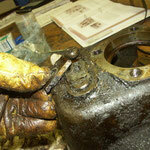 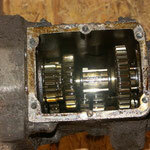 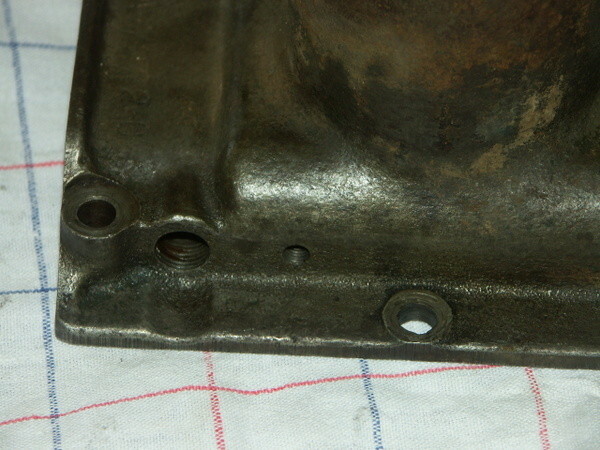 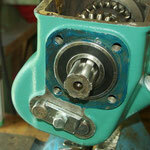 See first pictures of original conditions, the disassembly, resoration and assembly. 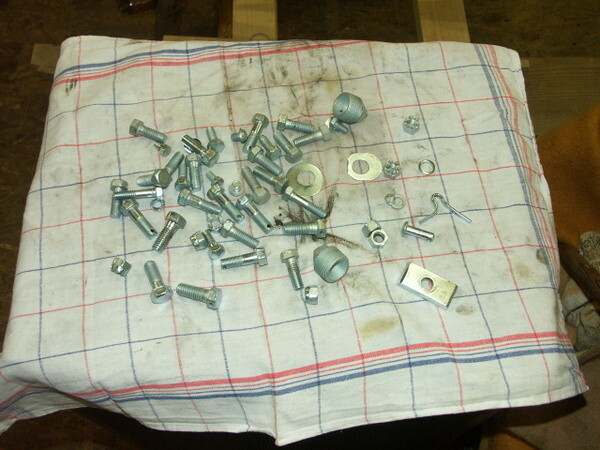 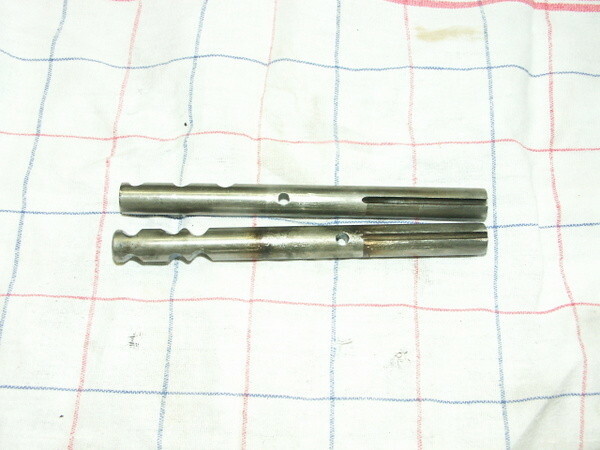 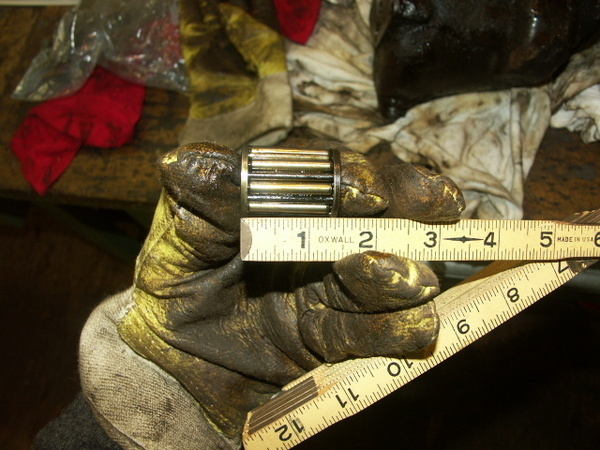 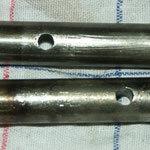 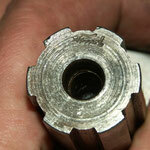 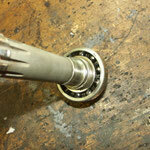 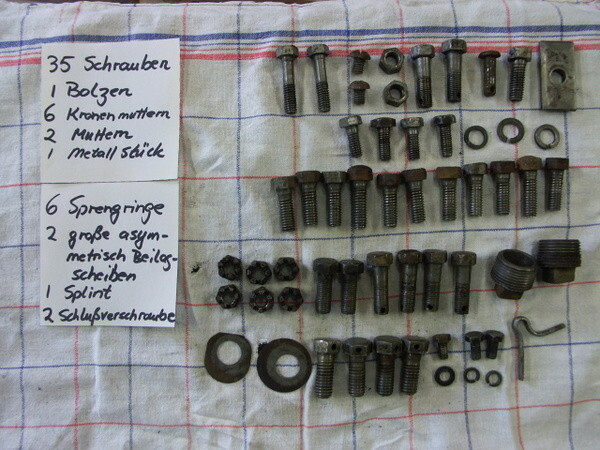 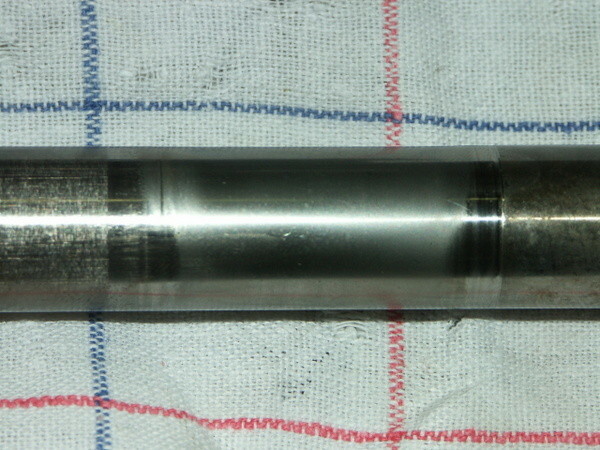 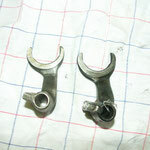 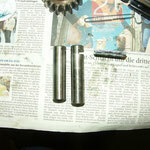 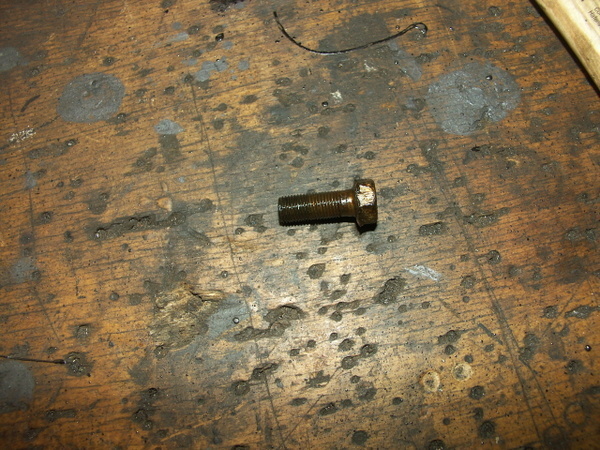 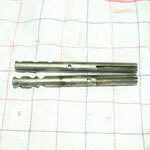 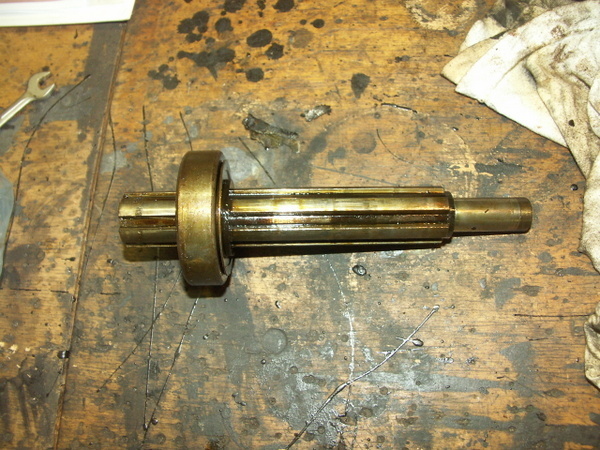 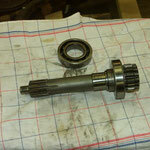 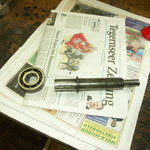 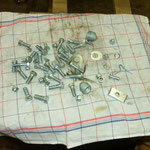 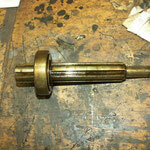 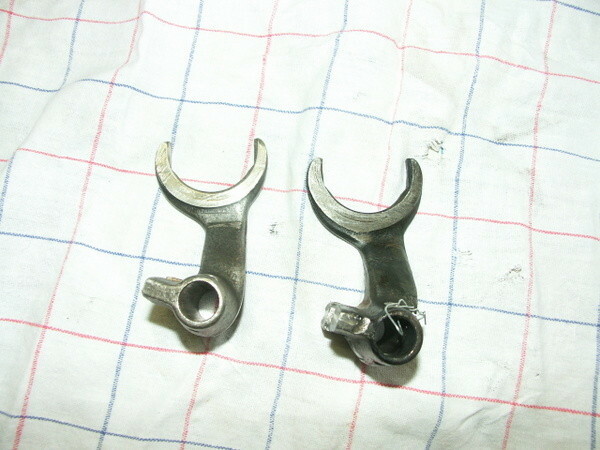 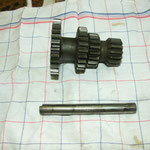 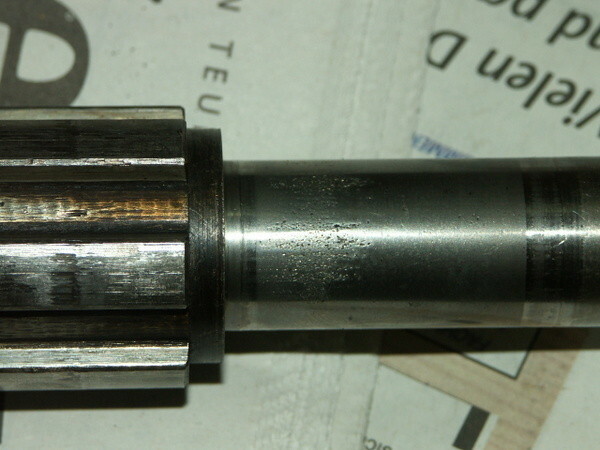 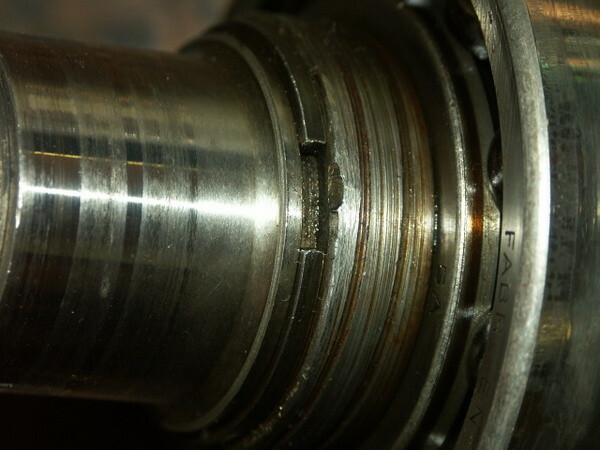 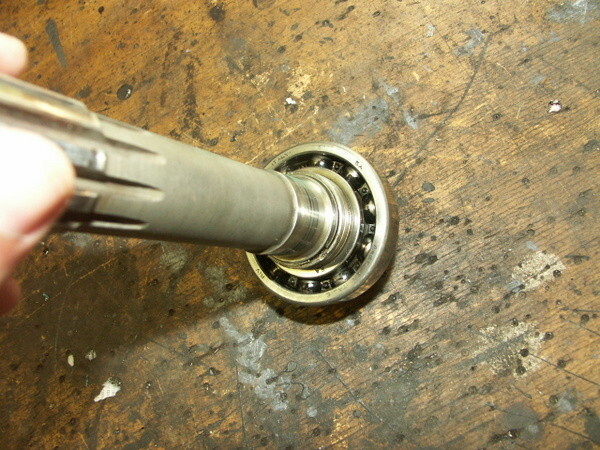 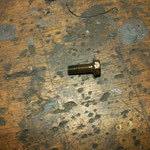 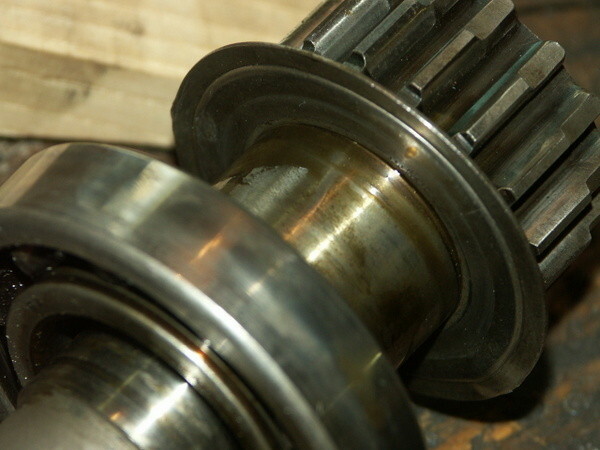 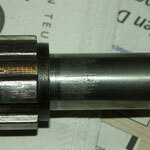 All bearings, countershaft, plunger and spring, shift fork pins (roll pins), plunger hole plug. 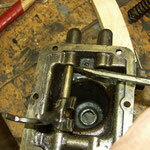 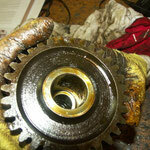 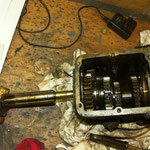 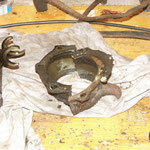 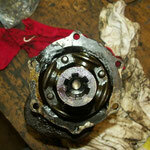 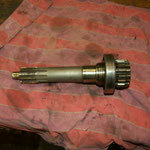 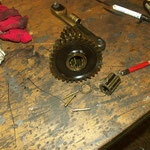 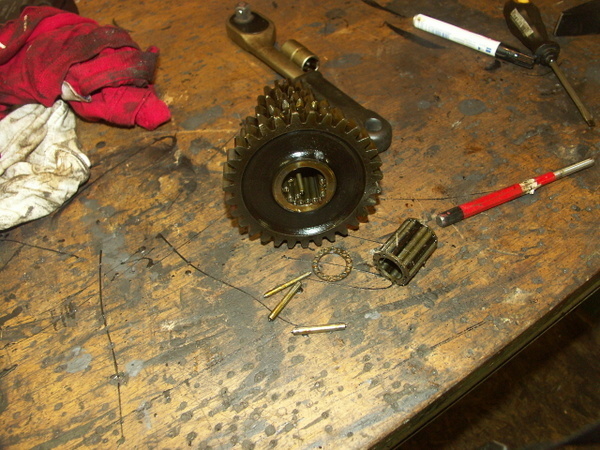 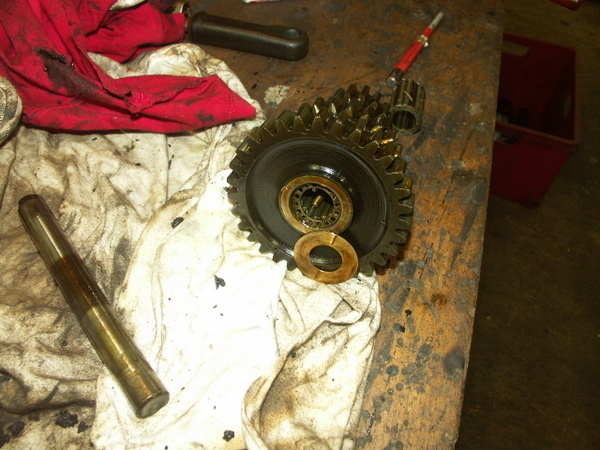 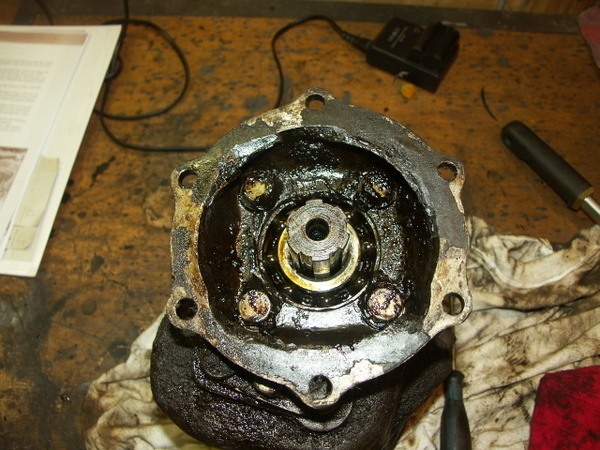 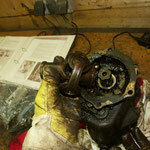 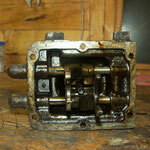 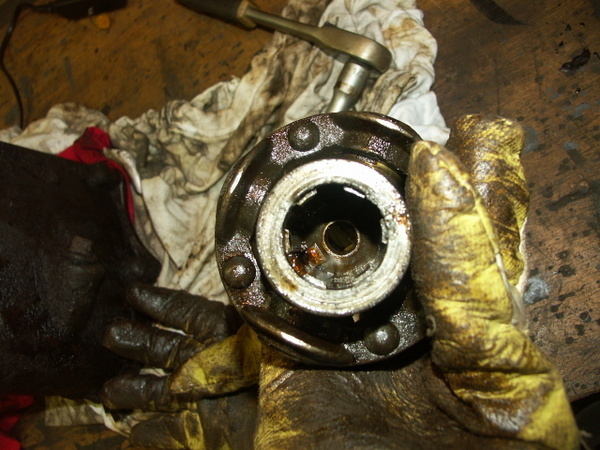 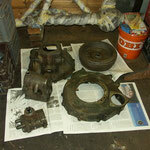 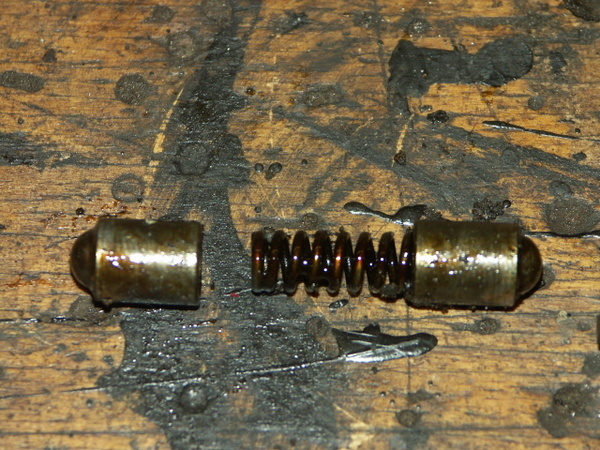 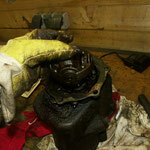 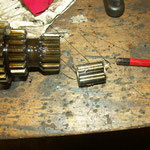 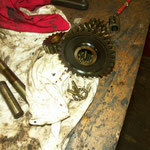 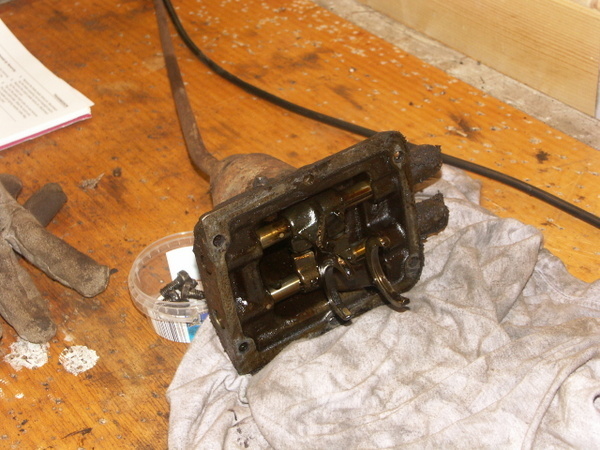 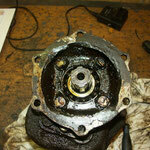 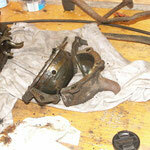 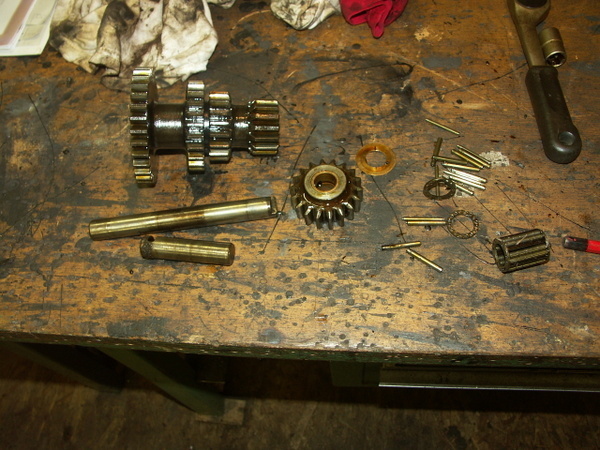 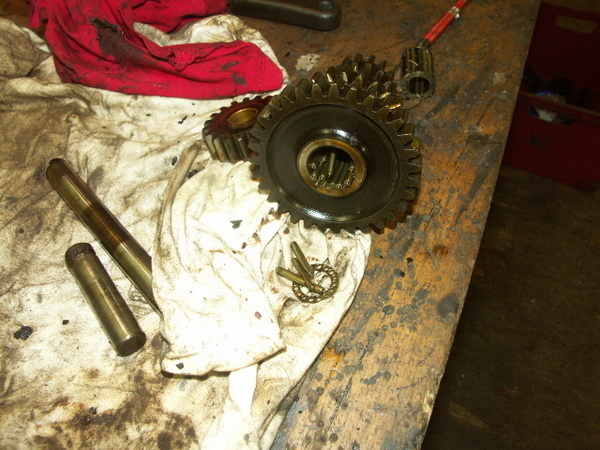 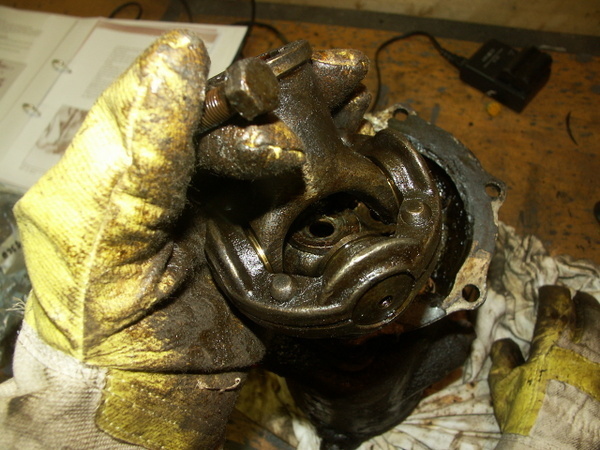 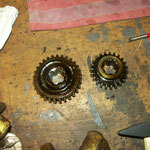 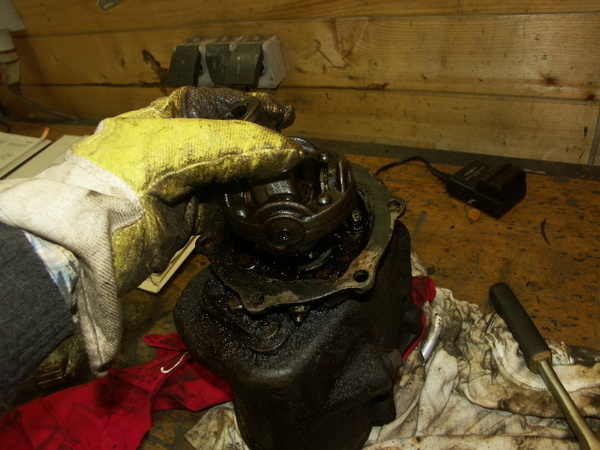 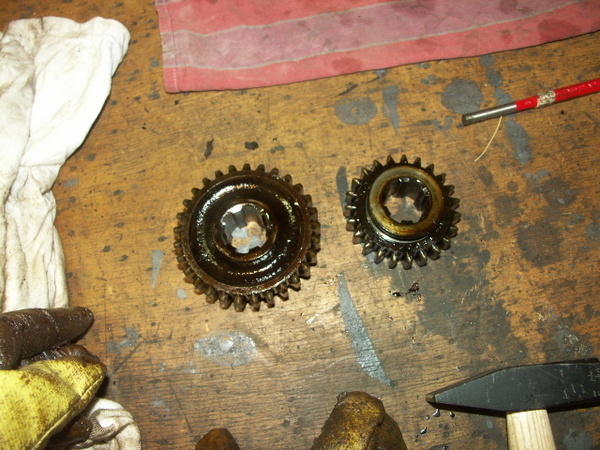 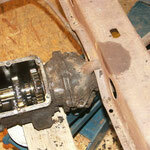 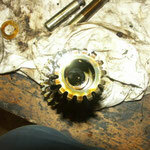 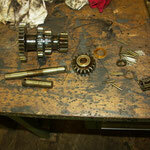 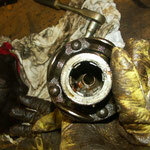 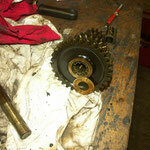 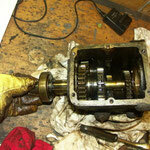 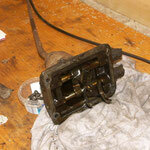 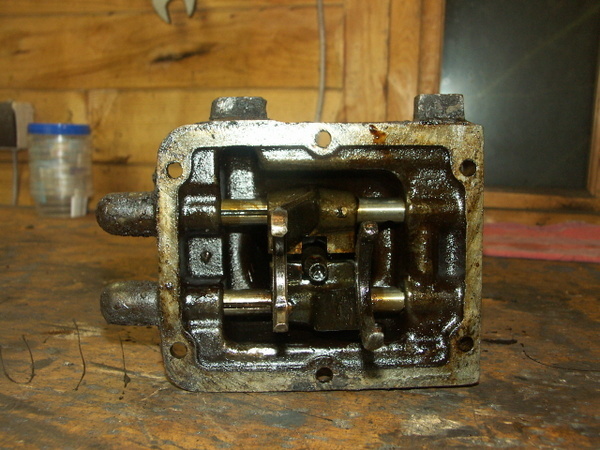 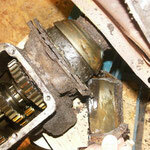 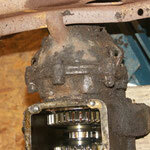 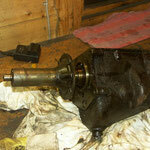 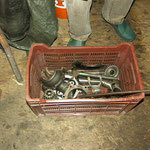 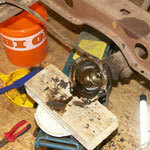 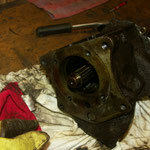 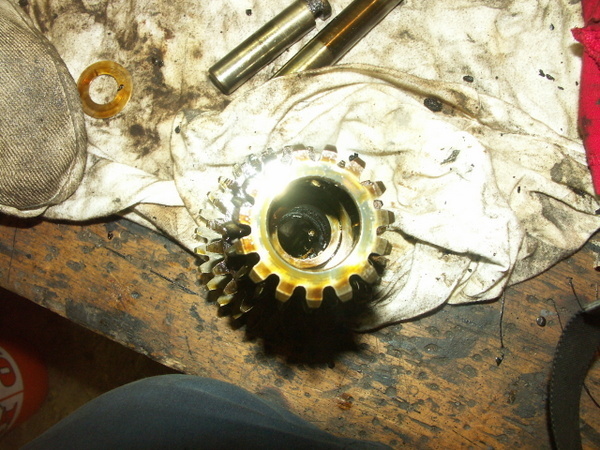 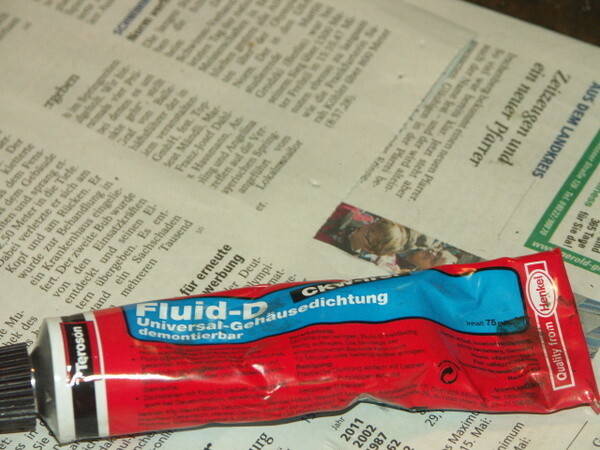 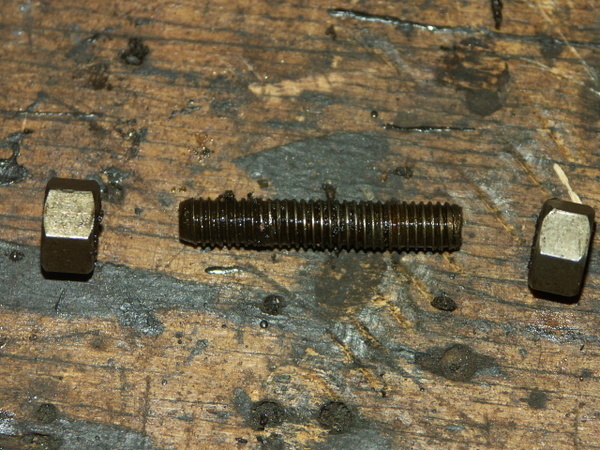 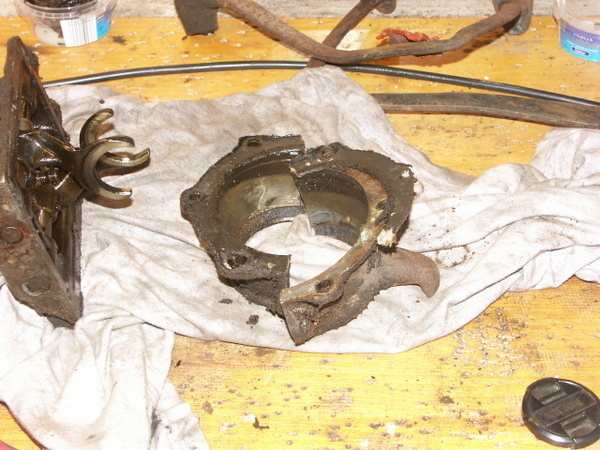 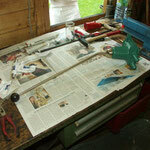 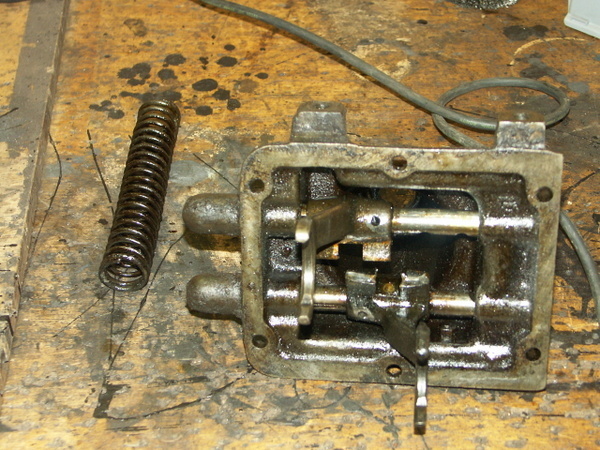 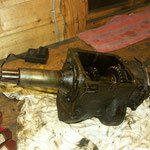 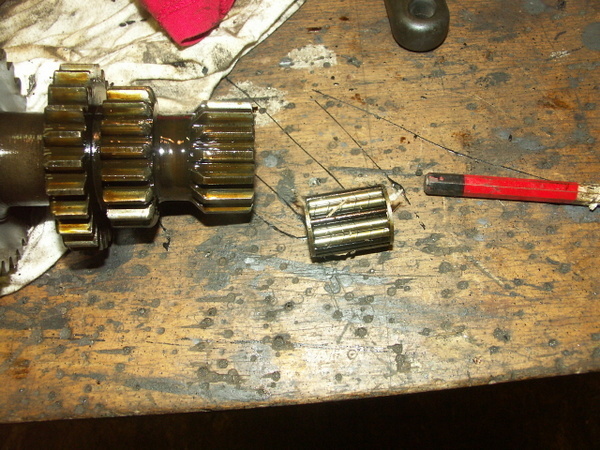 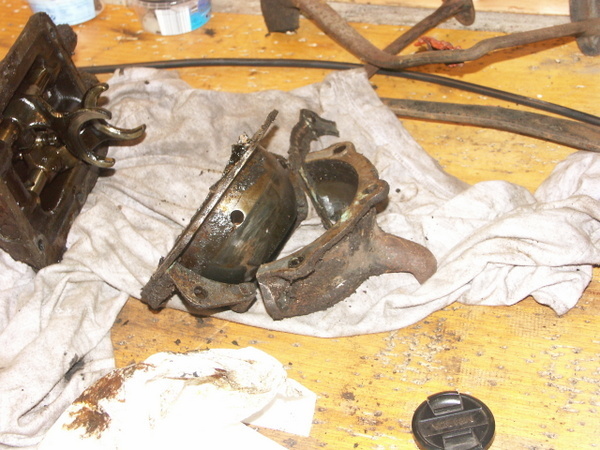 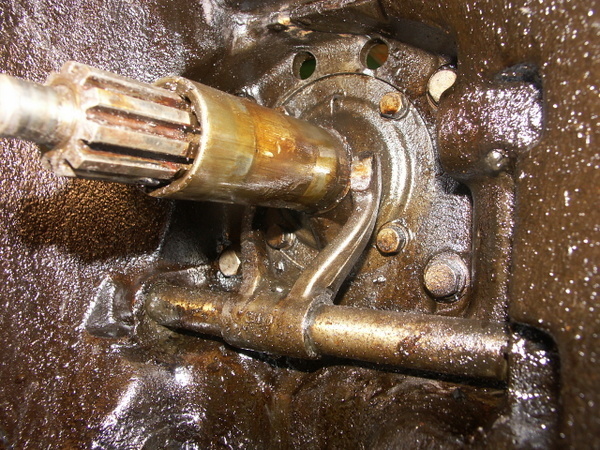 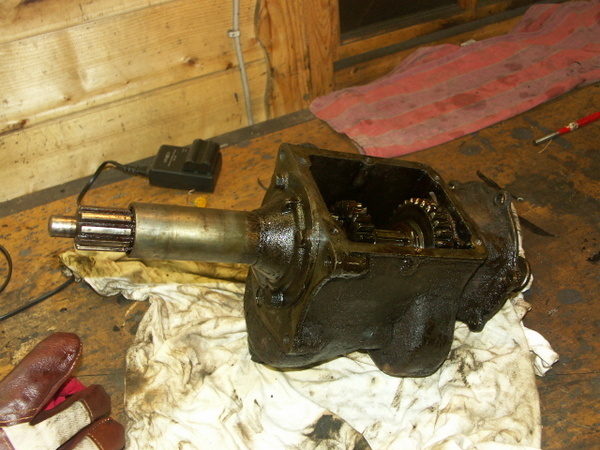 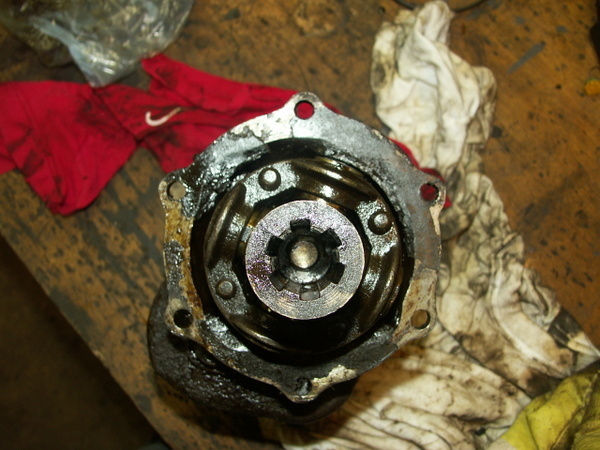 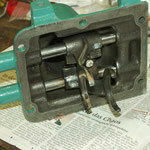 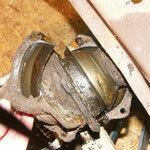 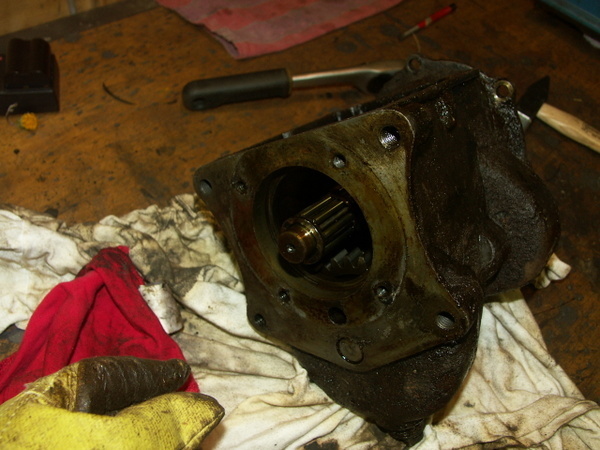 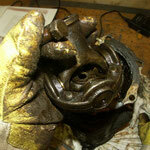 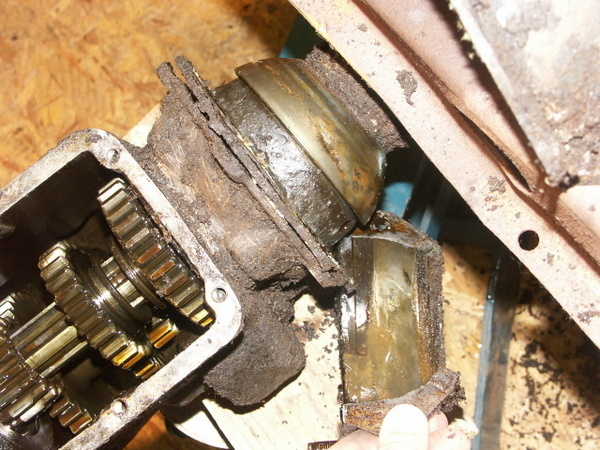 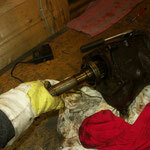 April 22nd 2012: Transmission disassembled. 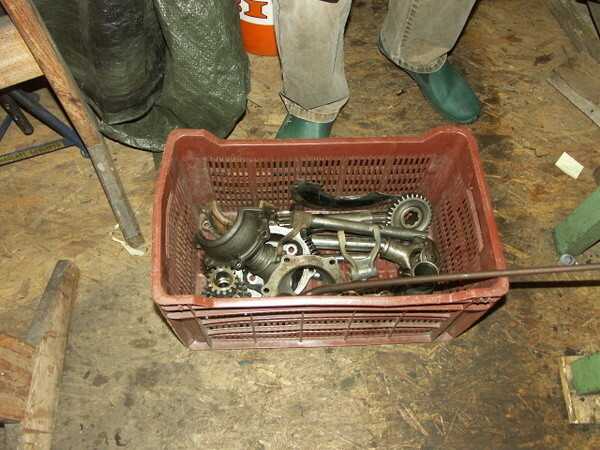 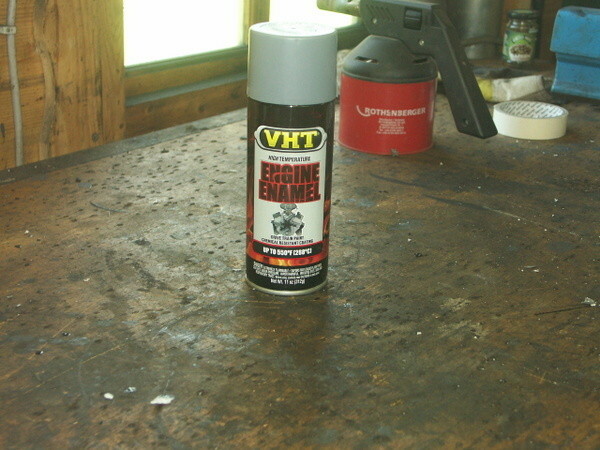 ready for cleaning and inspection. 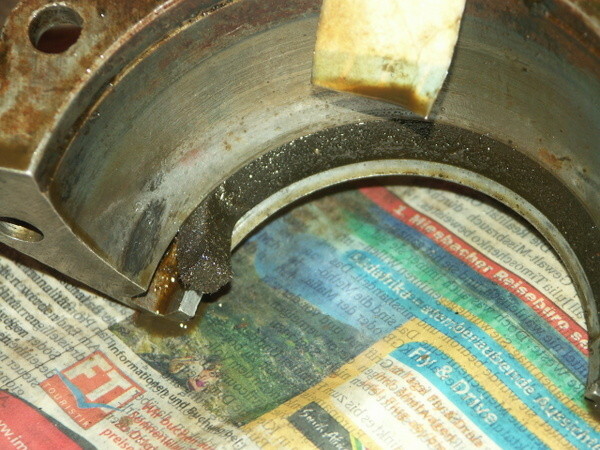 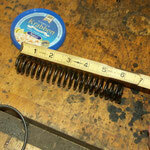 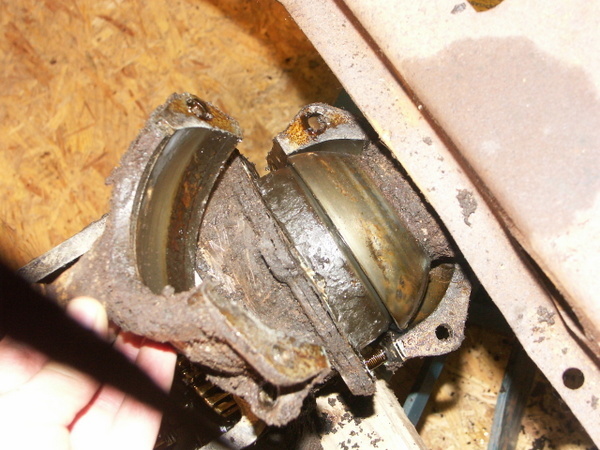 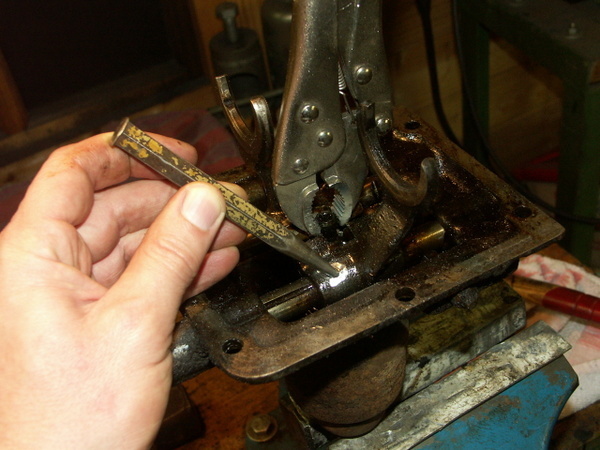 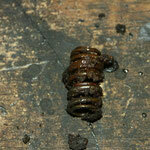 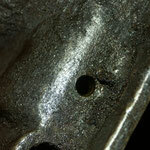 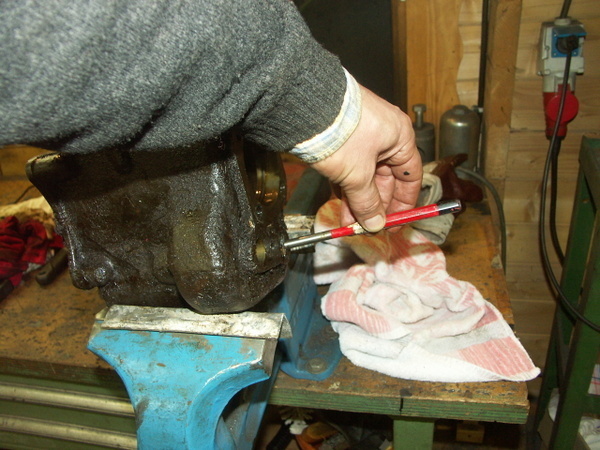 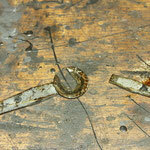 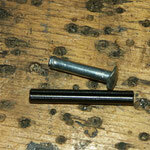 There was a strange mechanismus to close the hole for the plunger spring. 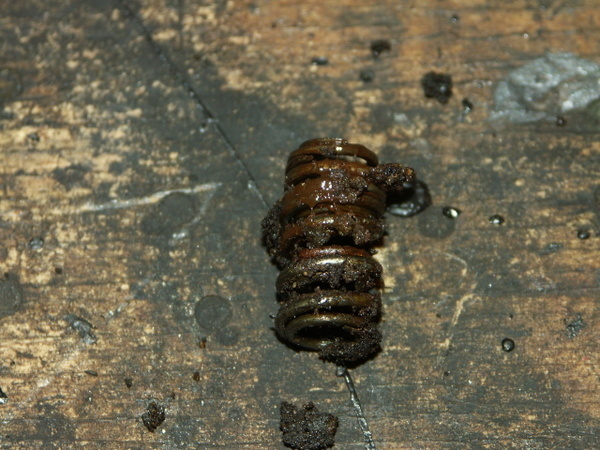 Obviously the original plug got lost sometimes. 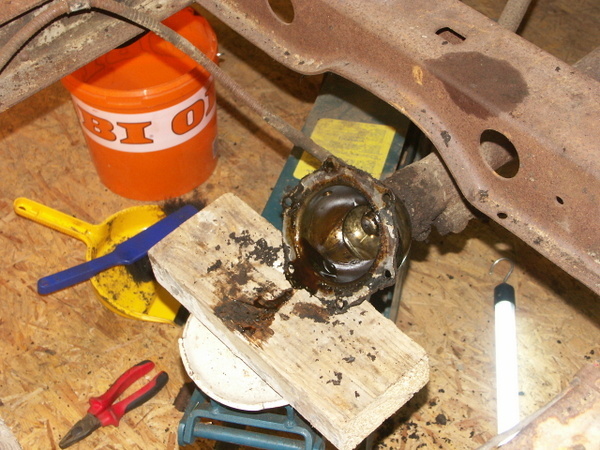 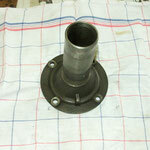 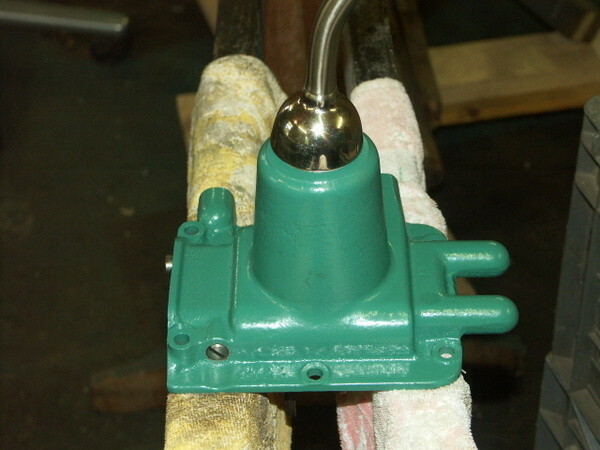 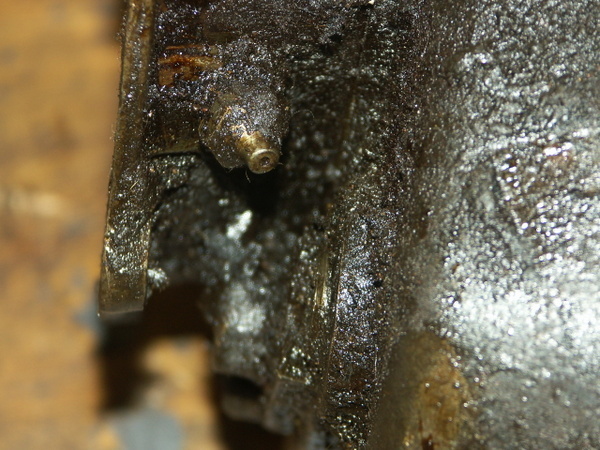 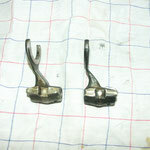 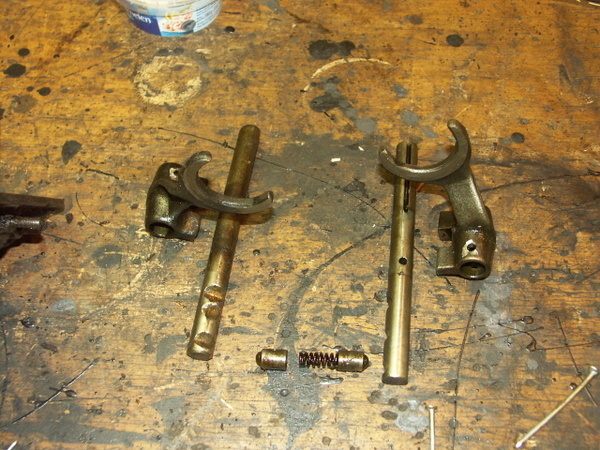 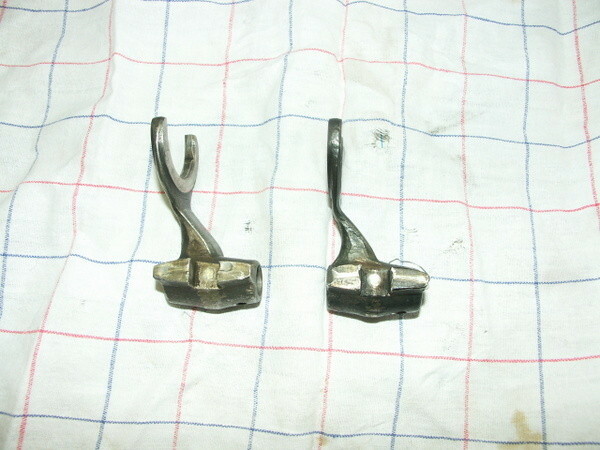 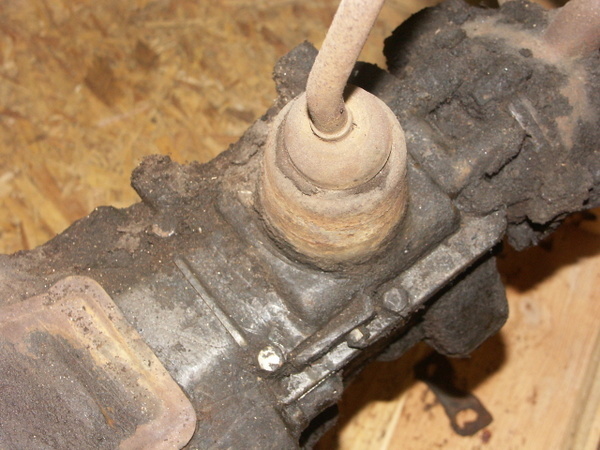 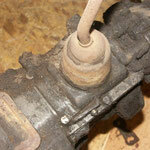 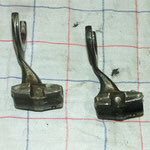 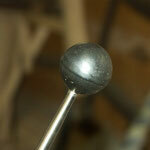 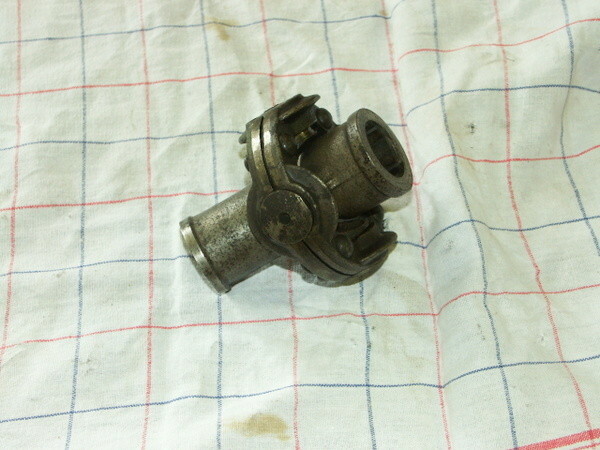 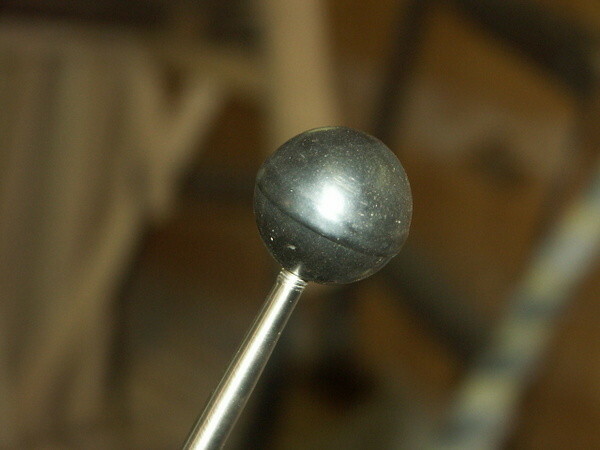 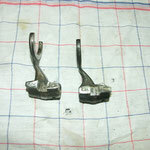 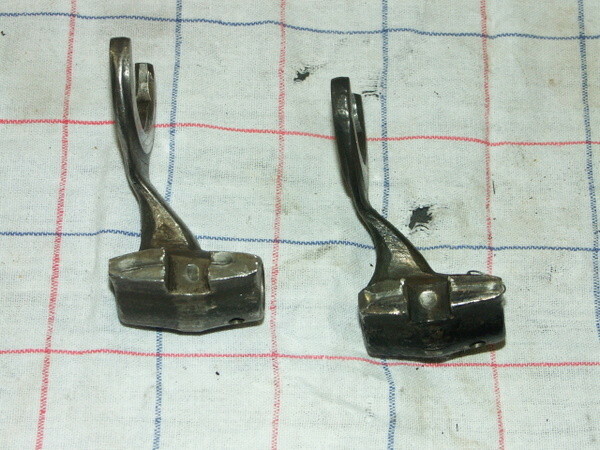 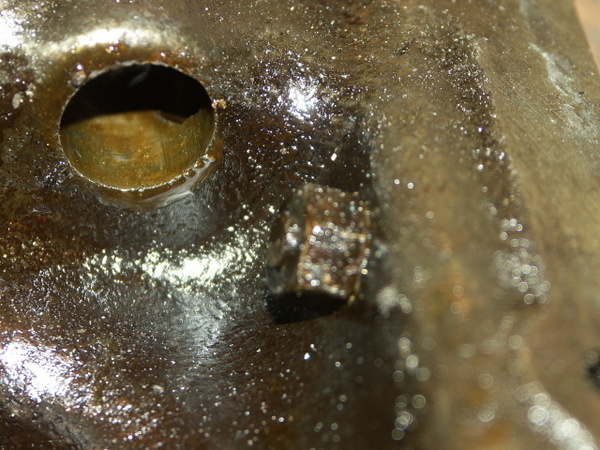 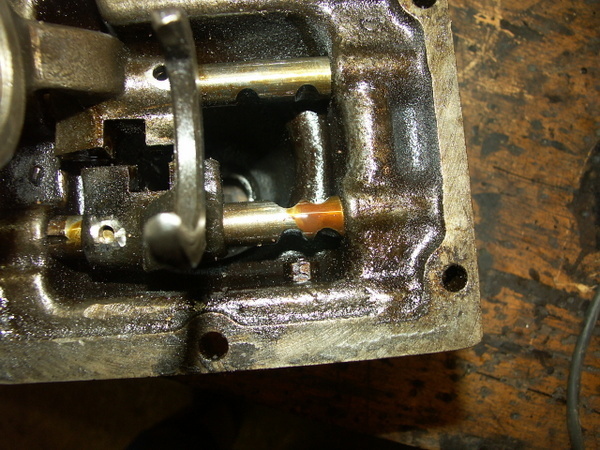 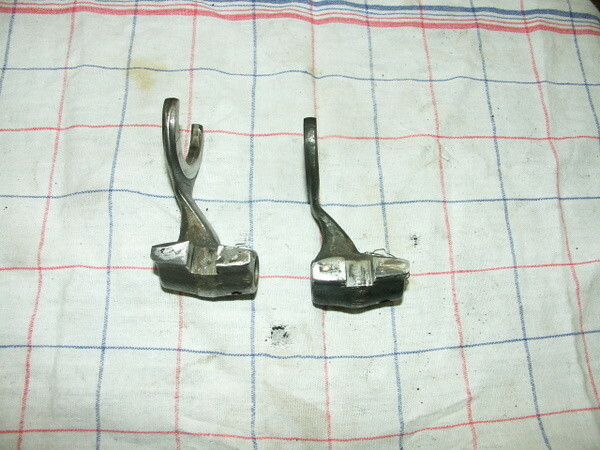 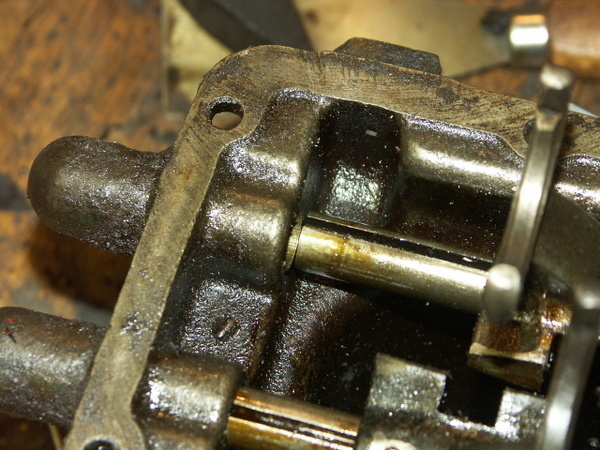 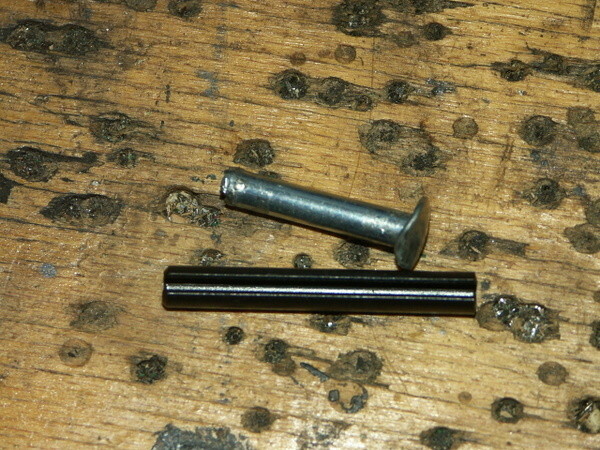 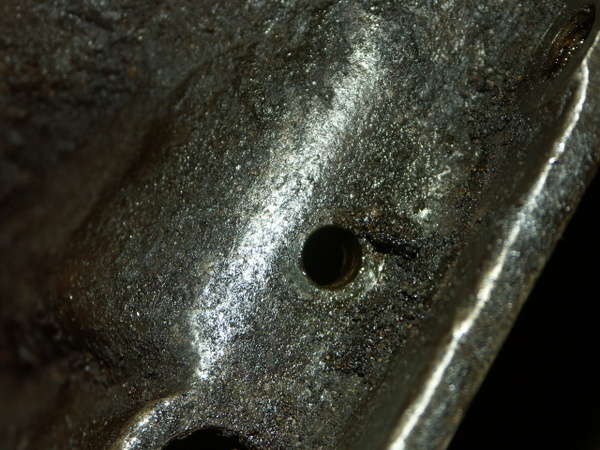 Also one of the shifter shafts had holes for the plunger on both sides. 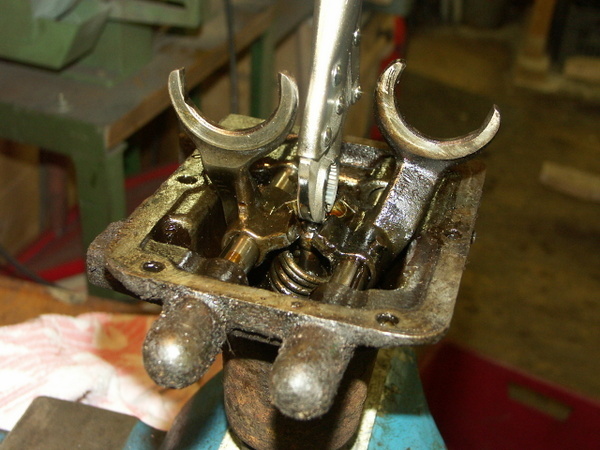 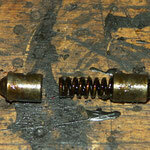 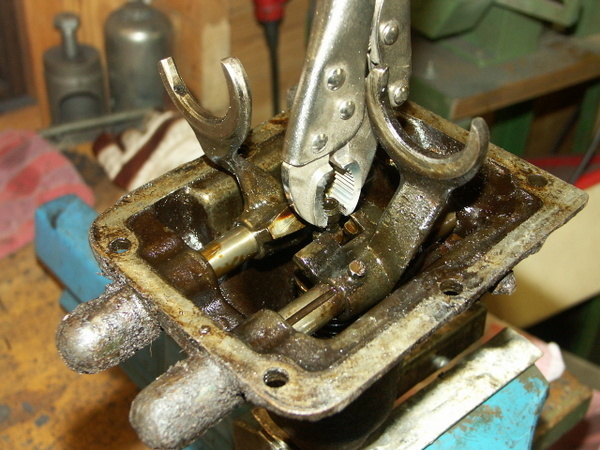 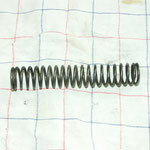 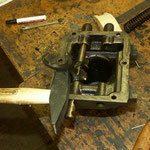 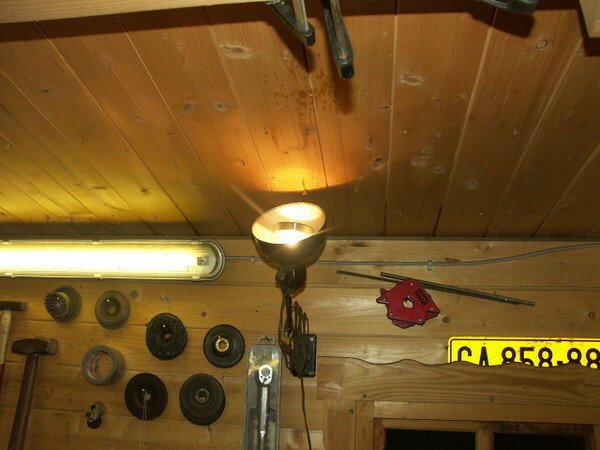 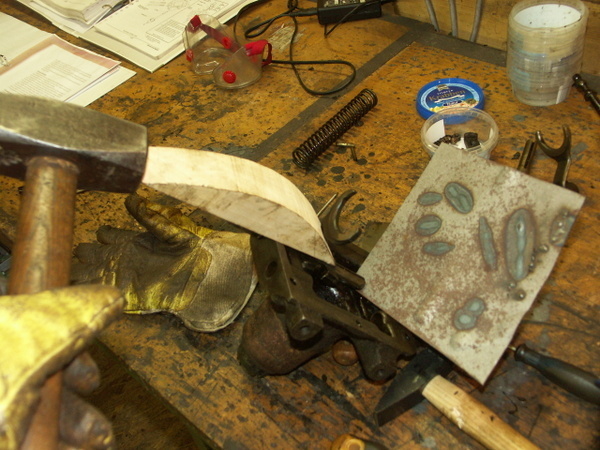 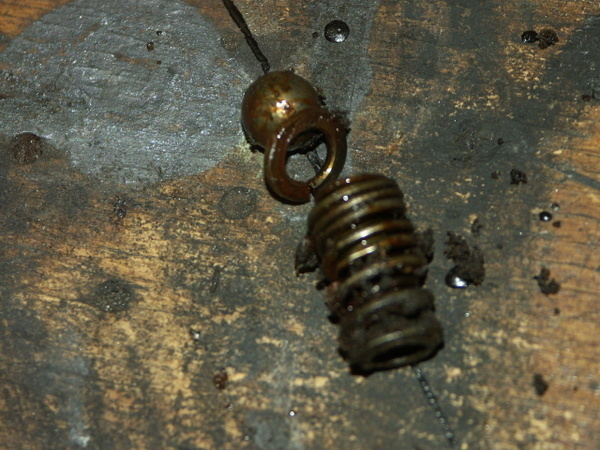 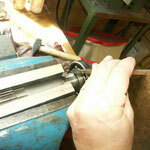 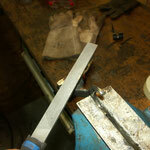 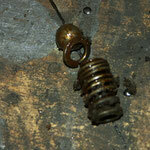 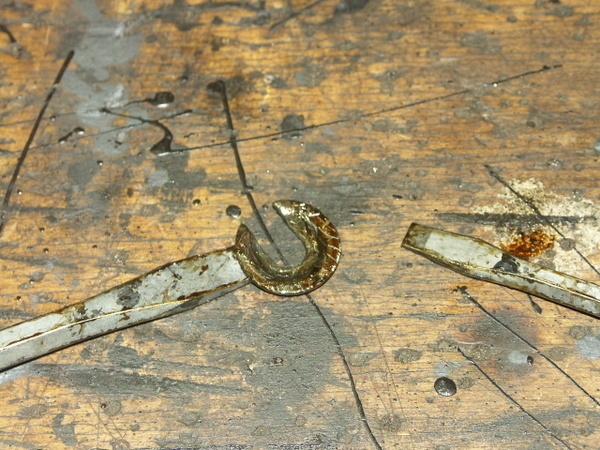 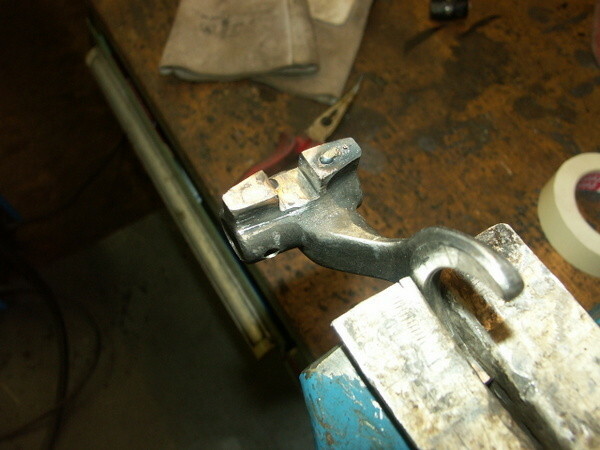 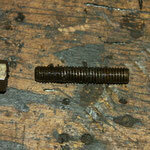 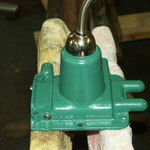 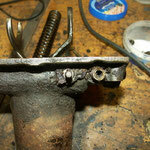 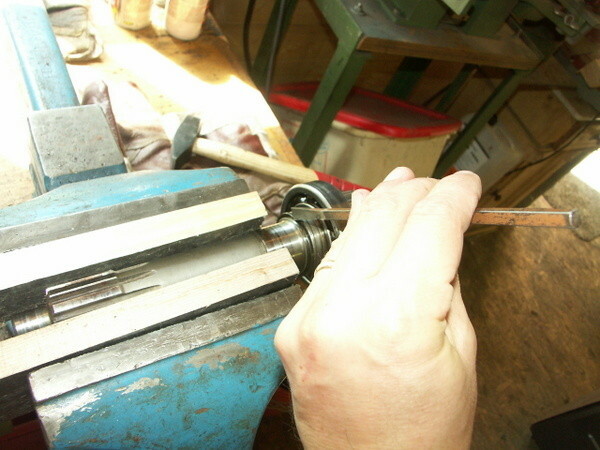 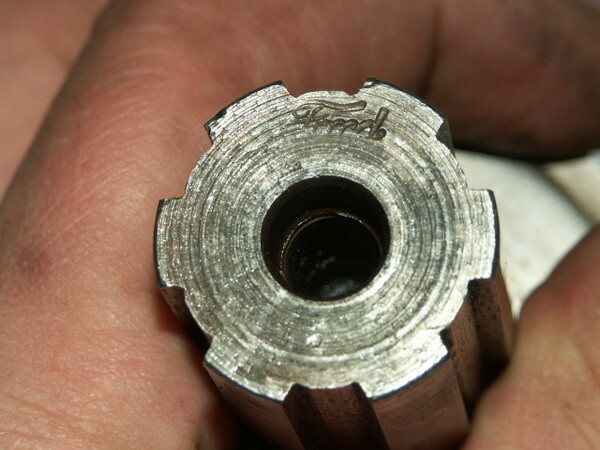 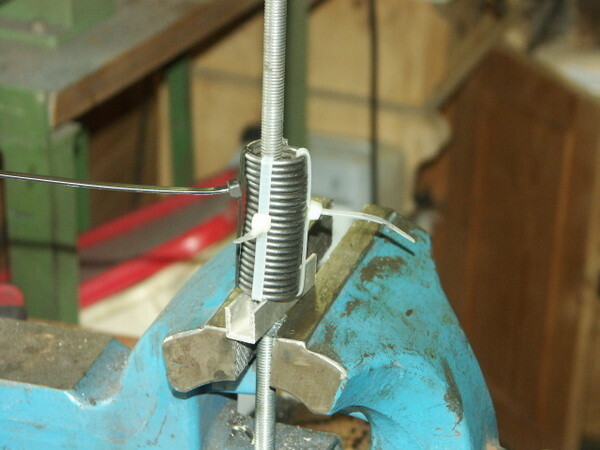 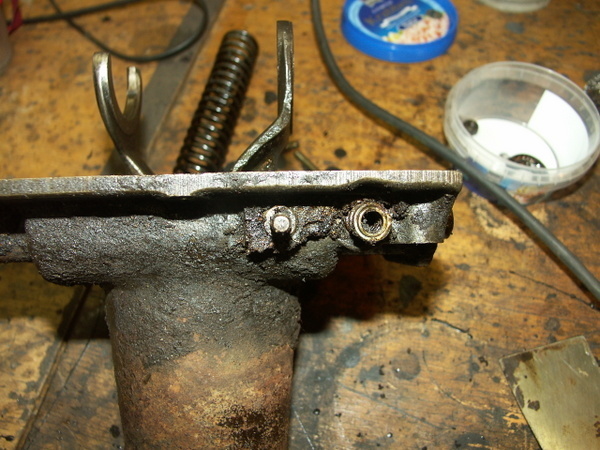 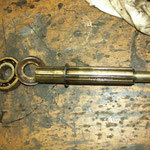 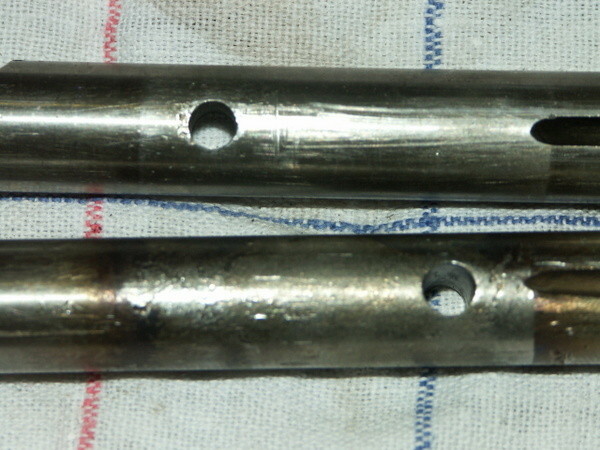 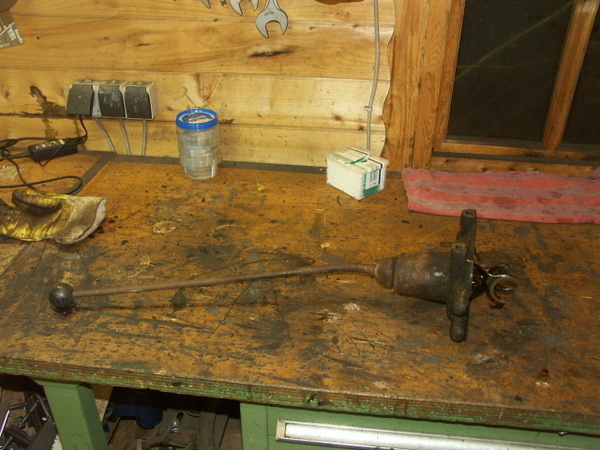 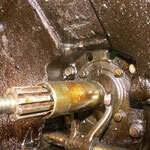 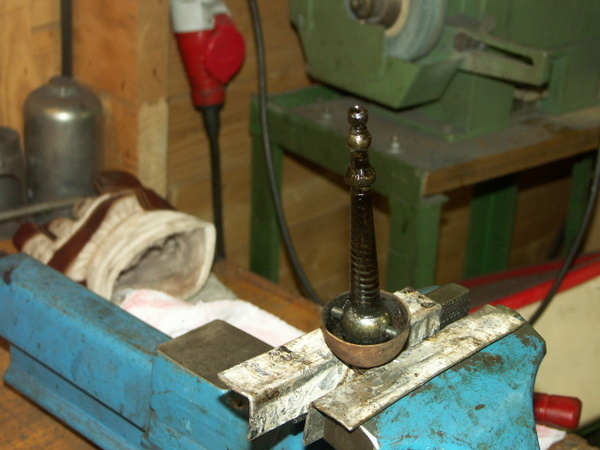 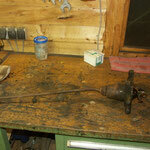 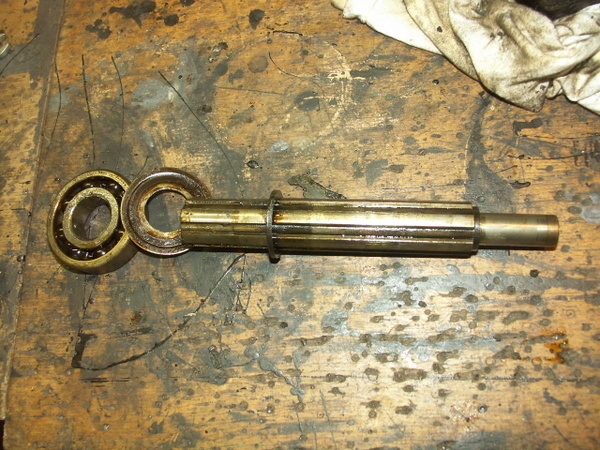 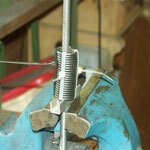 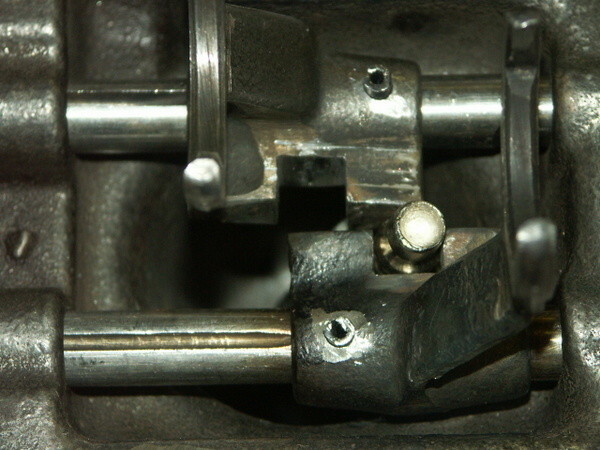 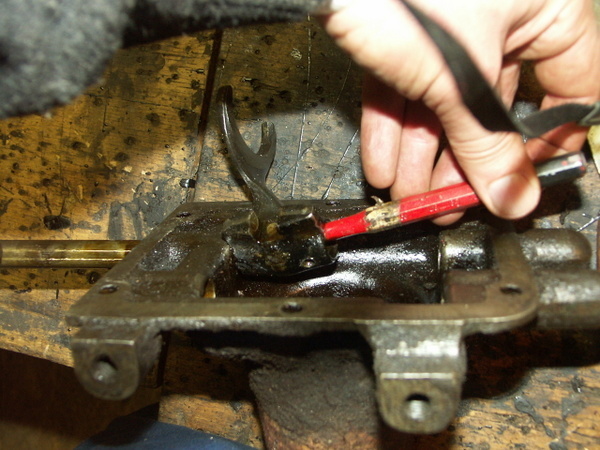 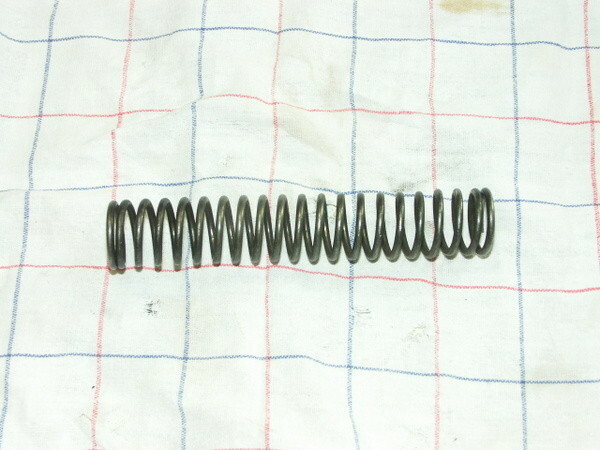 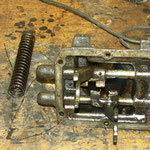 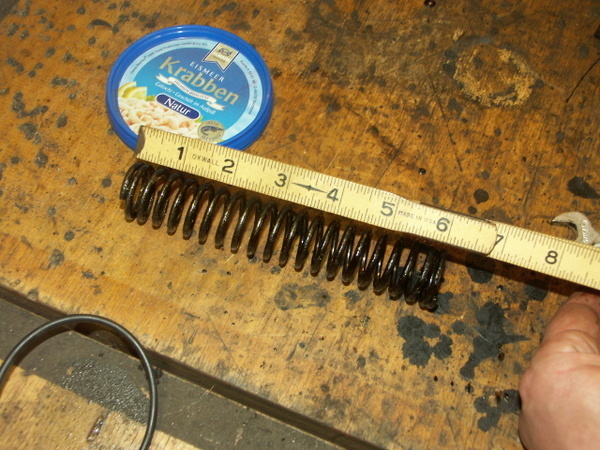 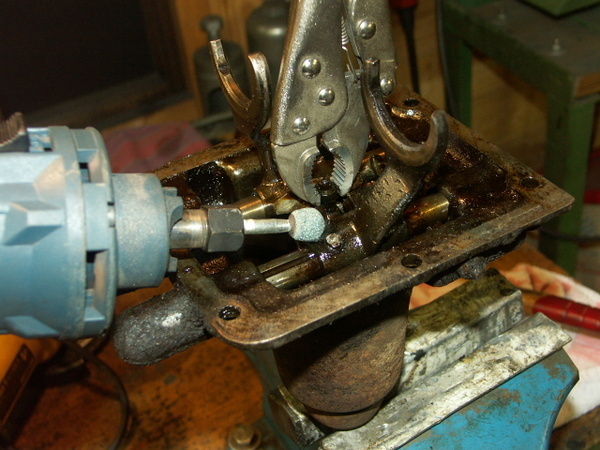 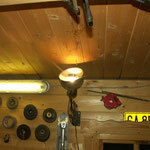 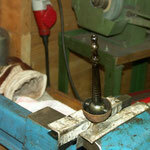 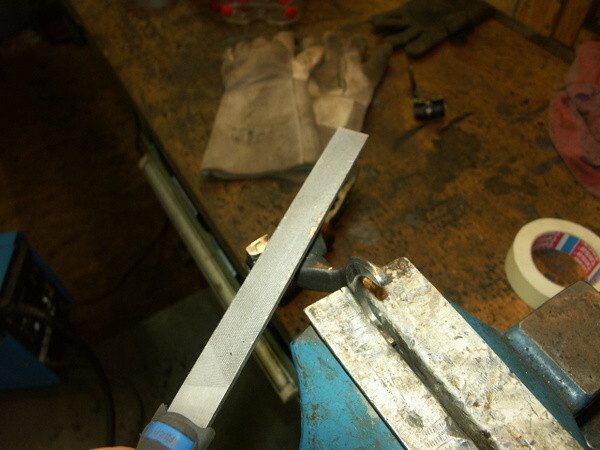 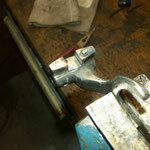 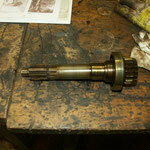 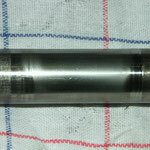 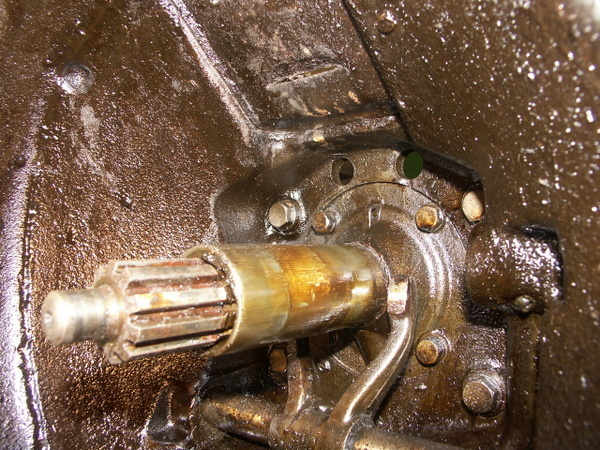 There was an additional spring in the outside of the shaft, not only one between the shafts. 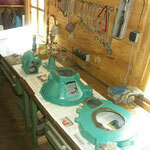 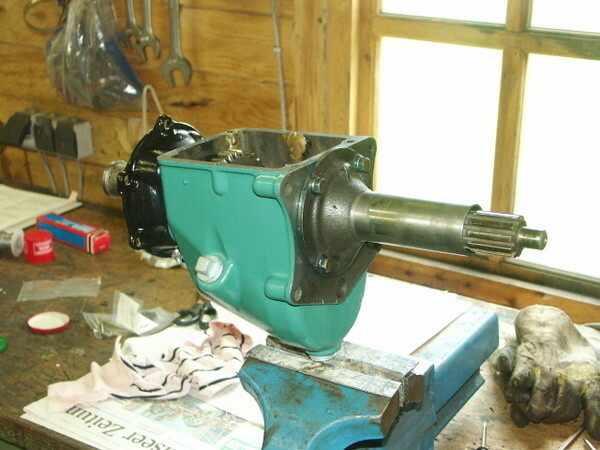 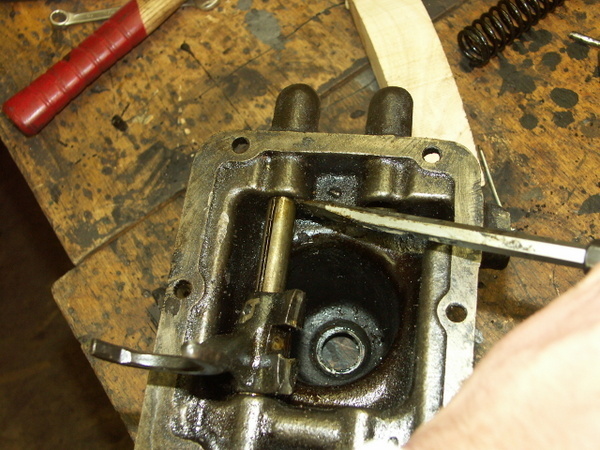 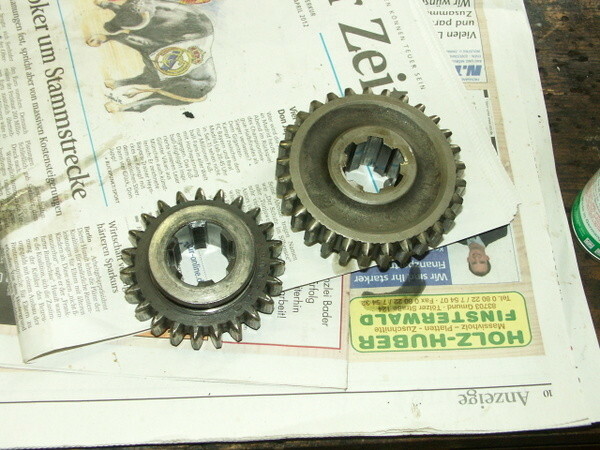 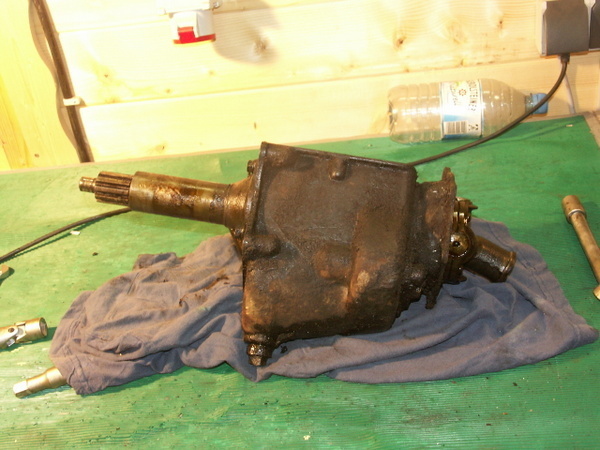 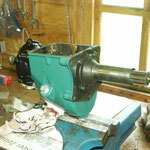 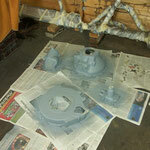 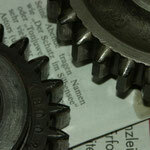 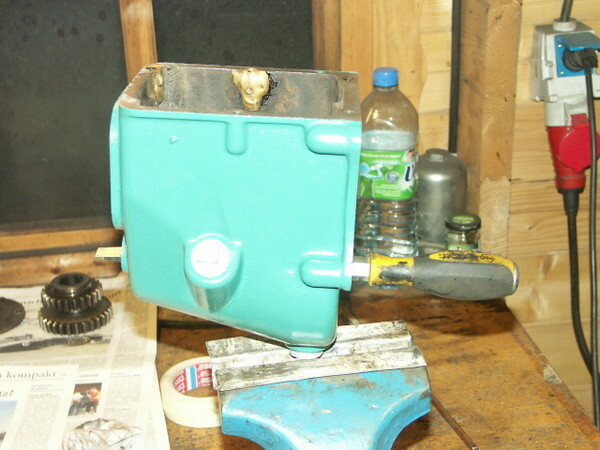 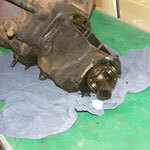 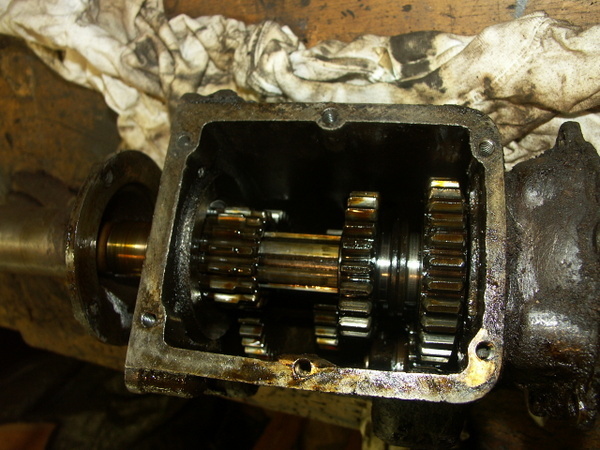 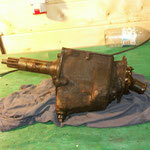 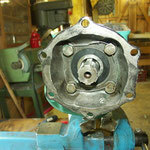 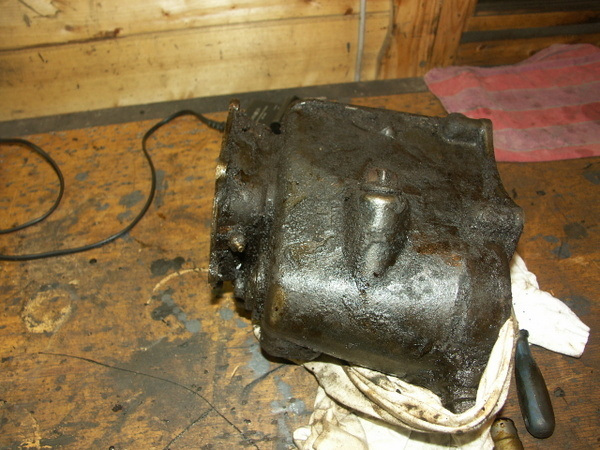 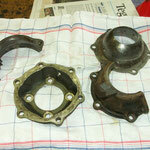 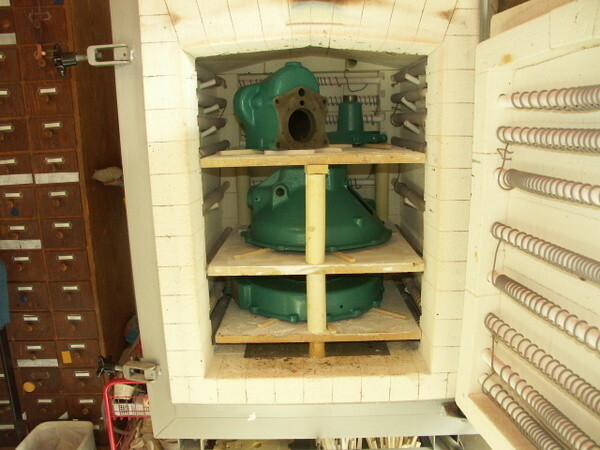 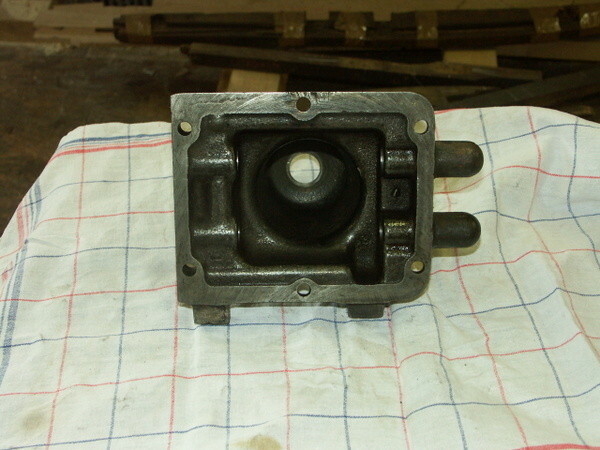 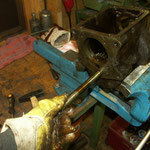 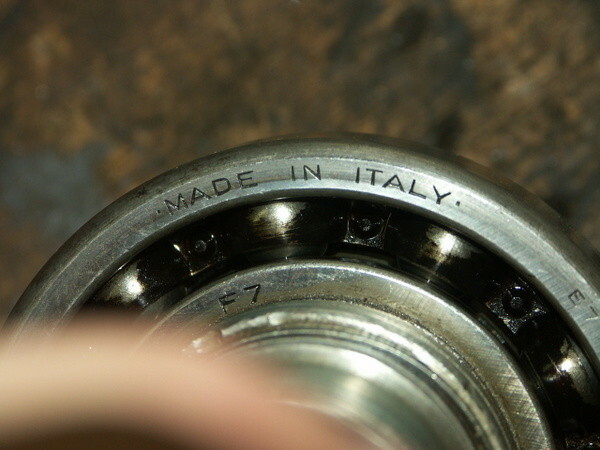 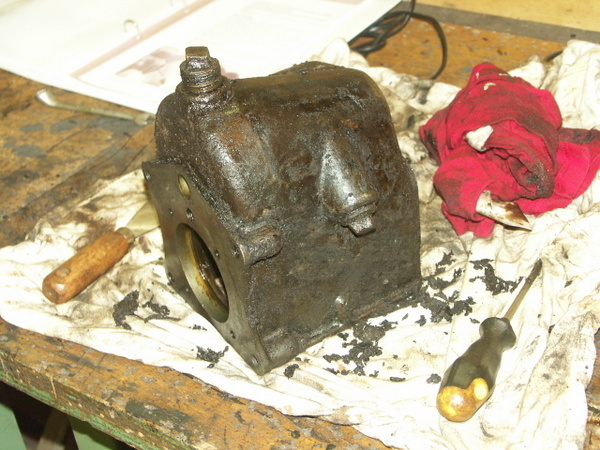 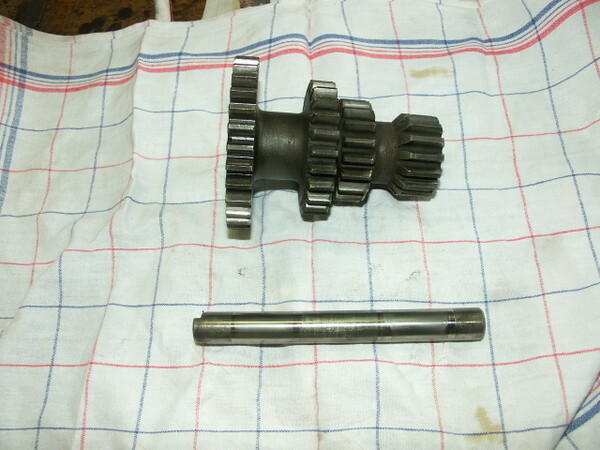 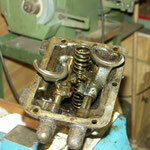 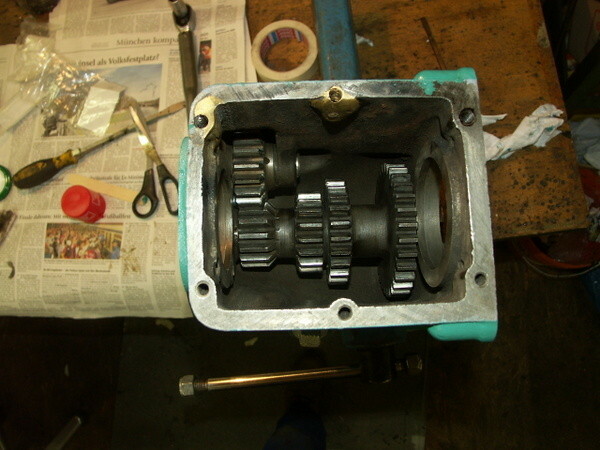 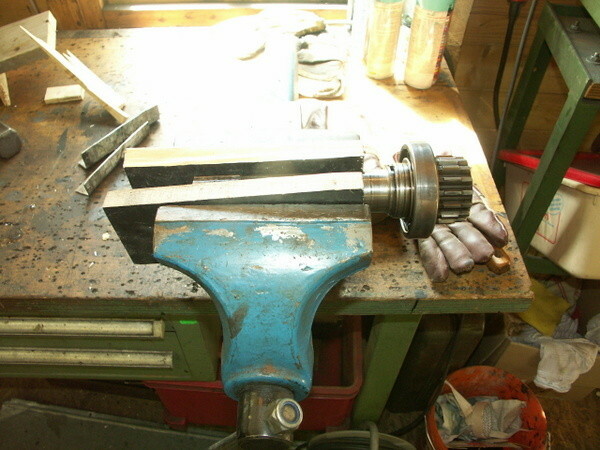 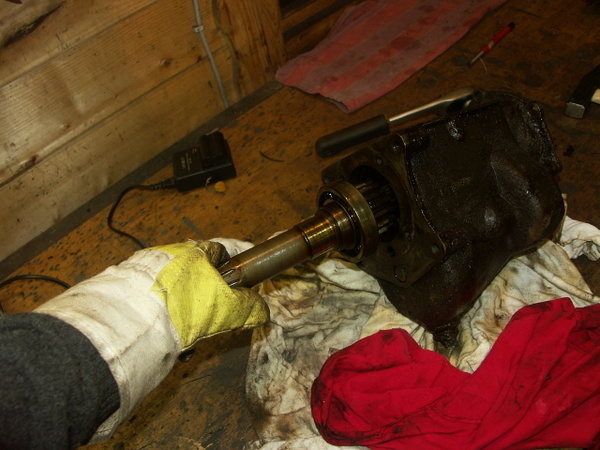 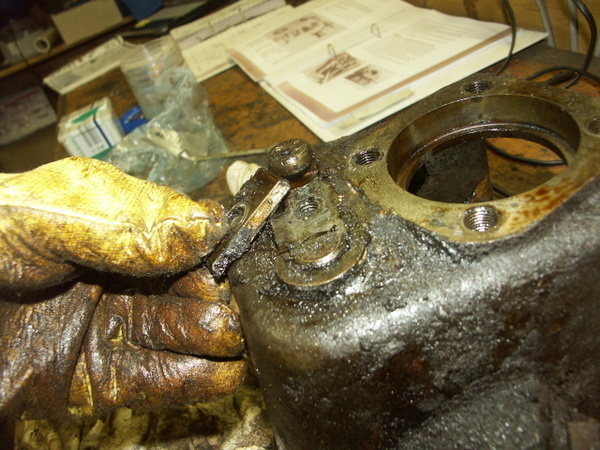 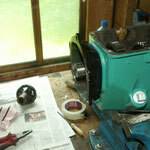 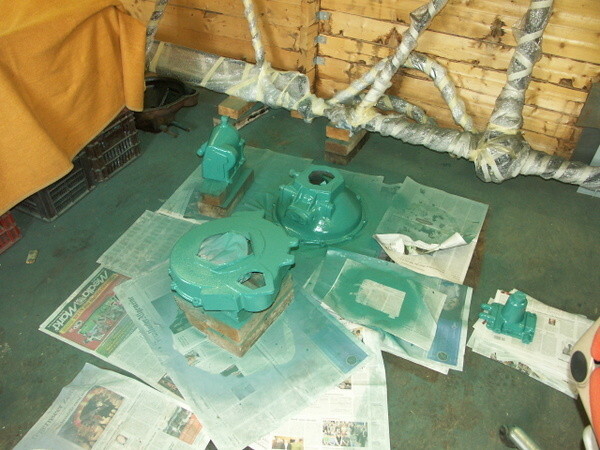 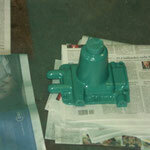 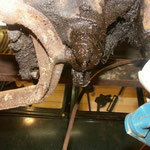 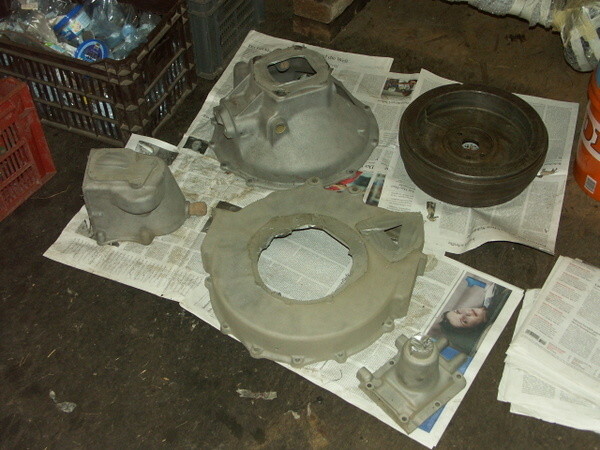 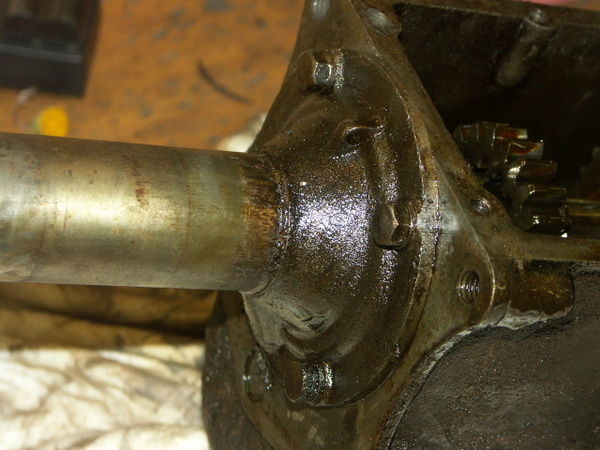 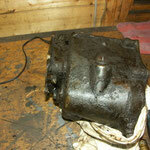 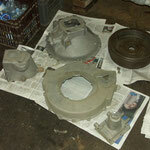 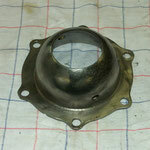 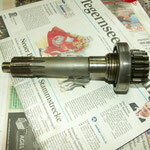 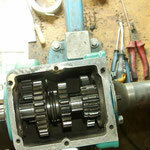 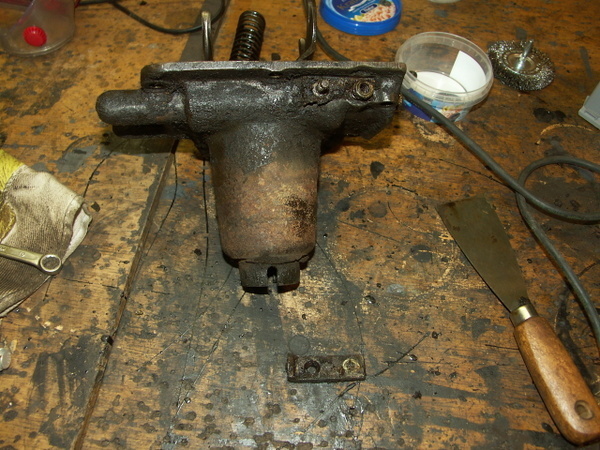 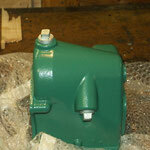 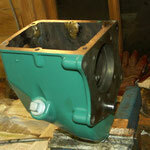 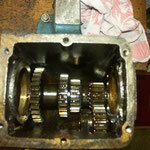 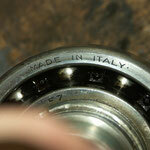 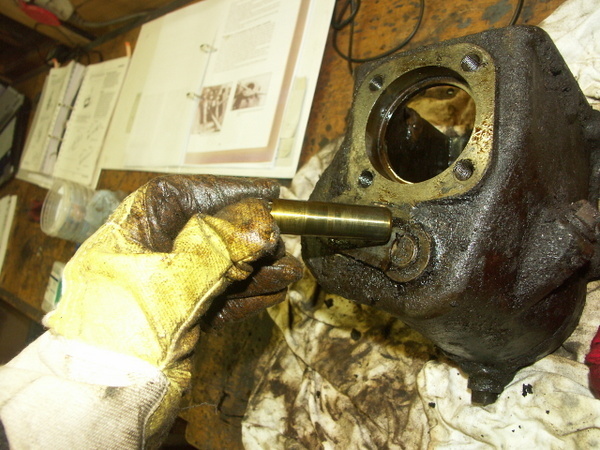 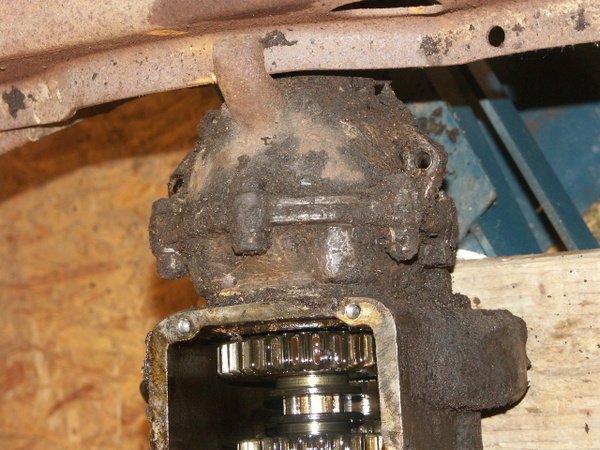 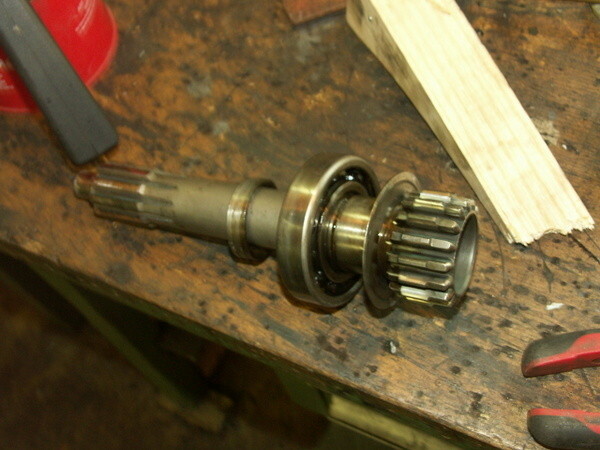 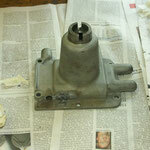 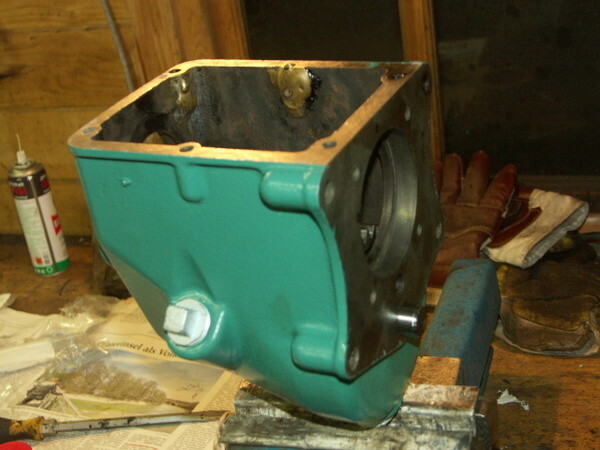 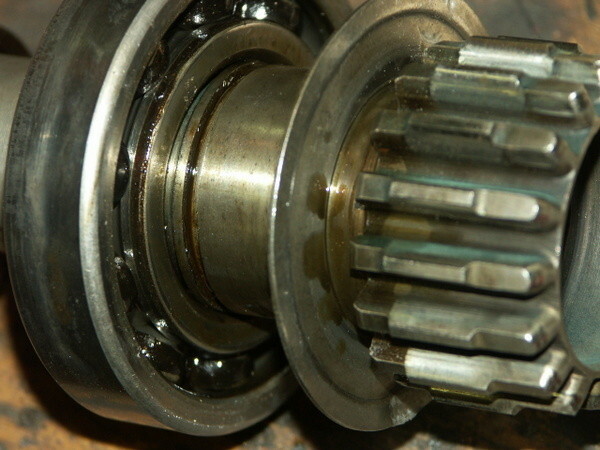 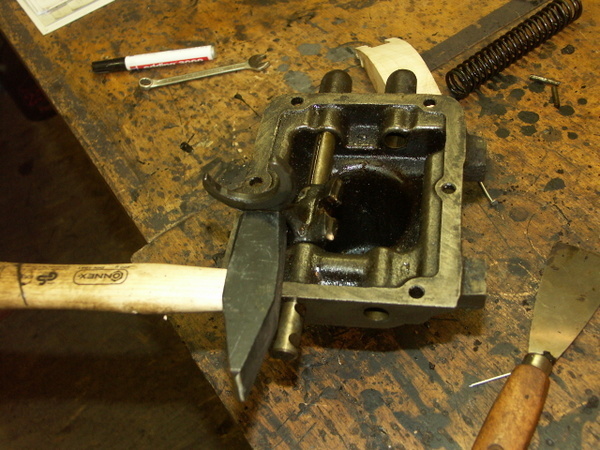 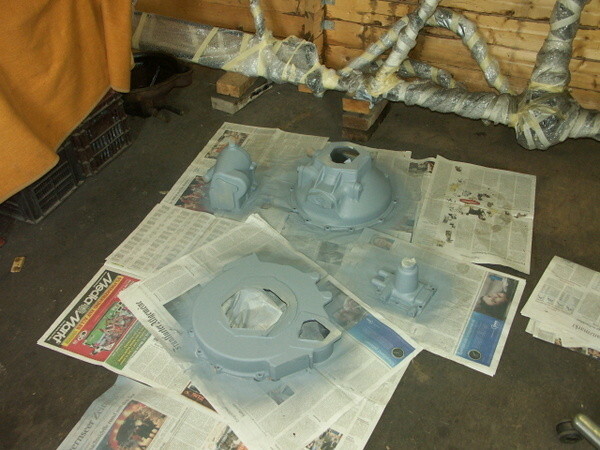 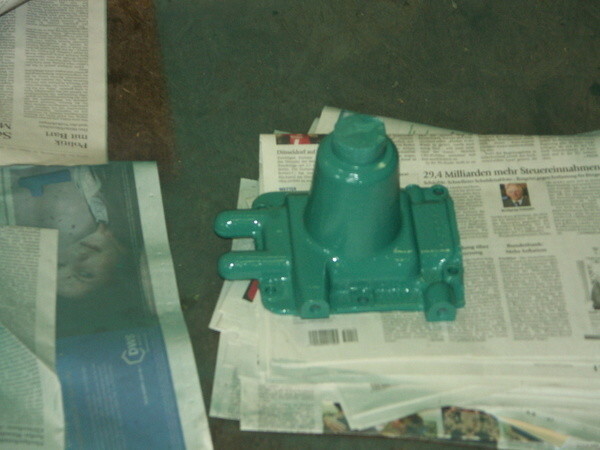 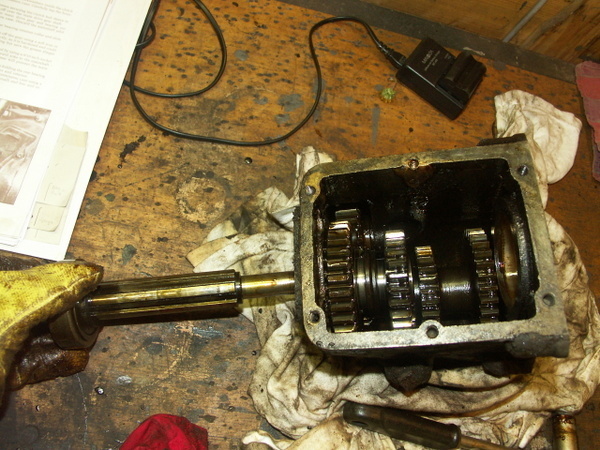 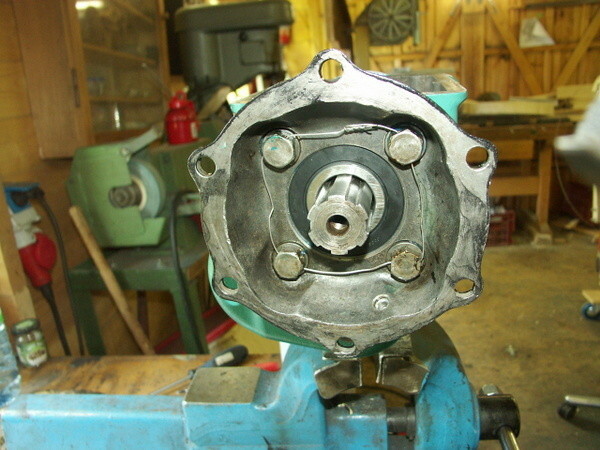 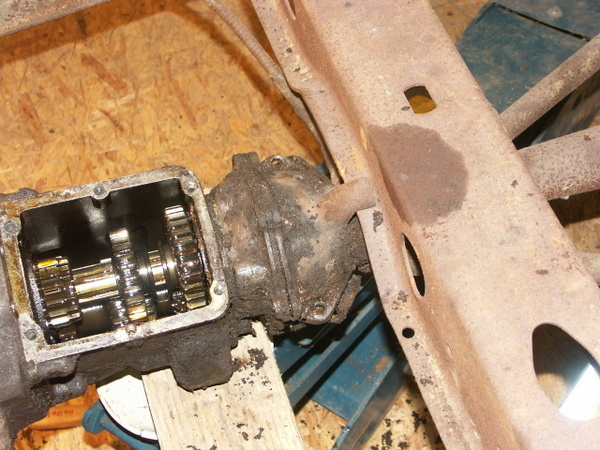 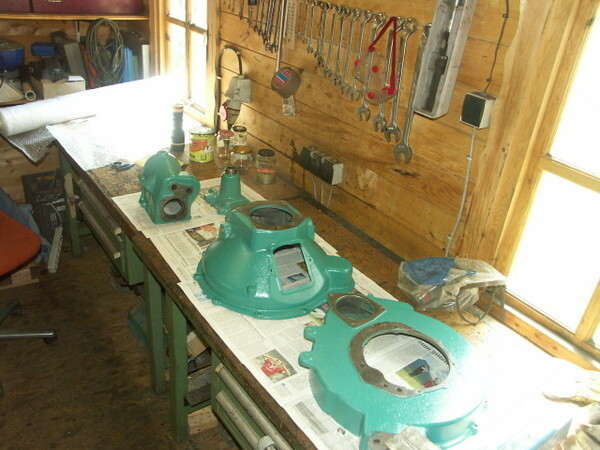 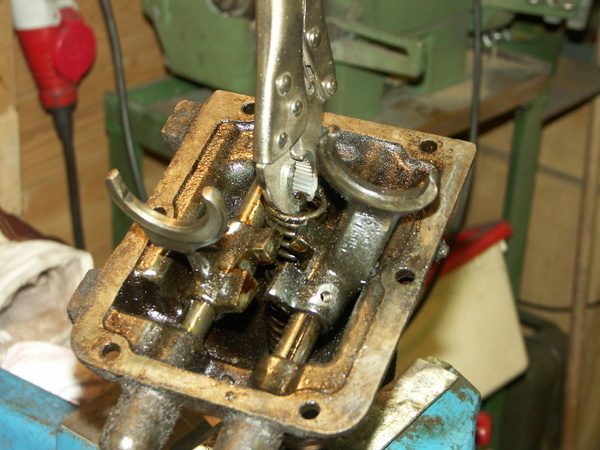 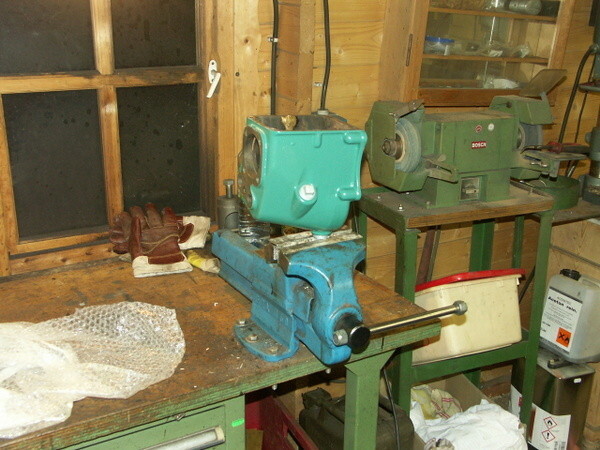 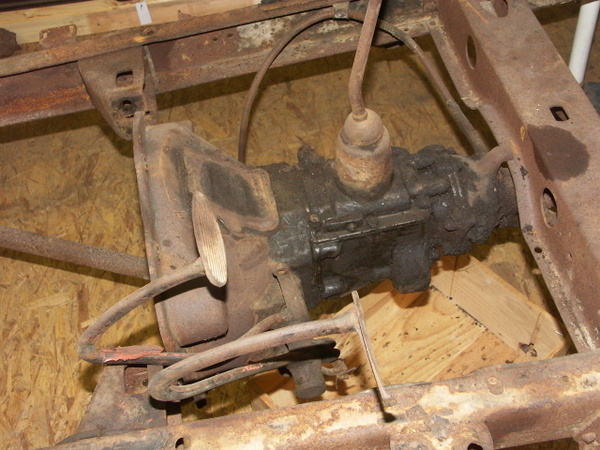 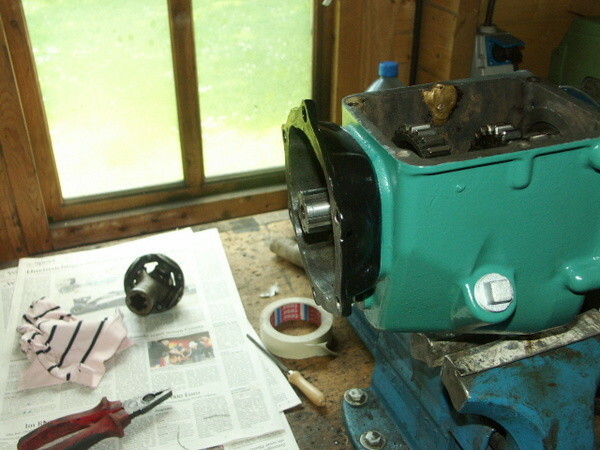 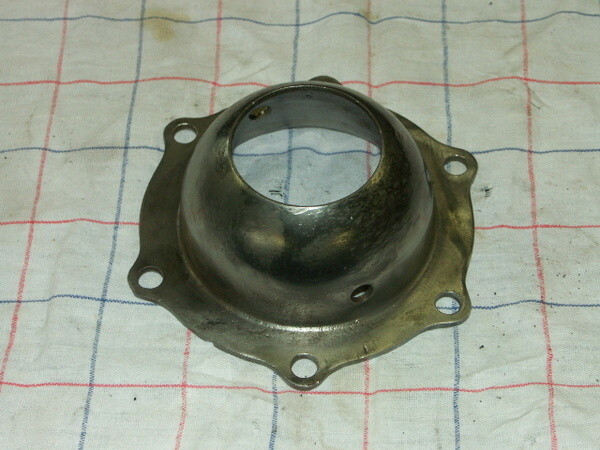 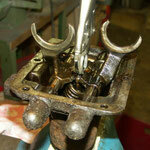 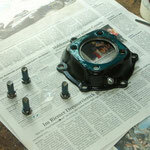 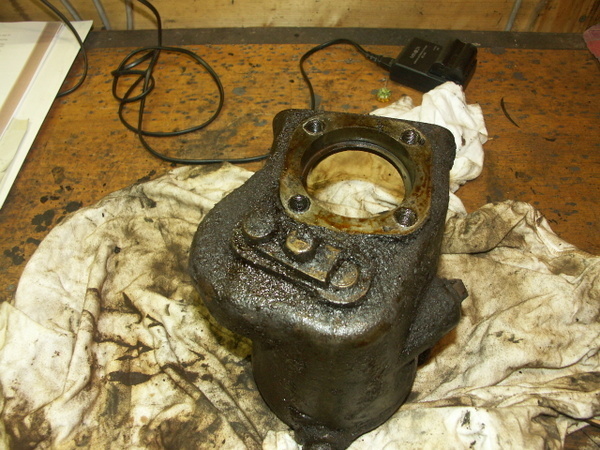 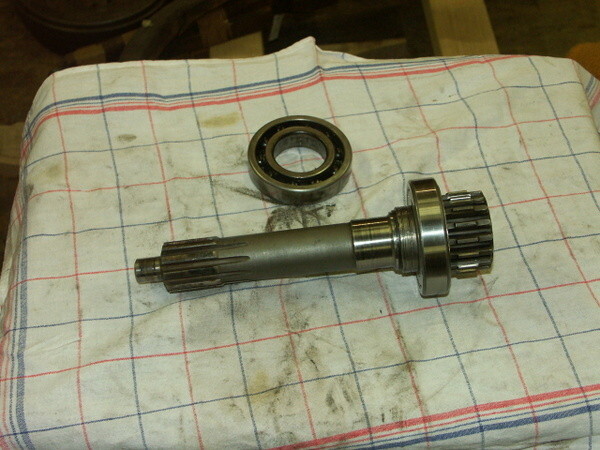 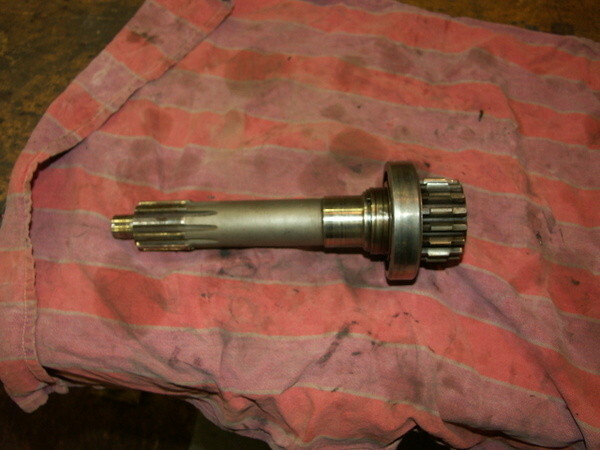 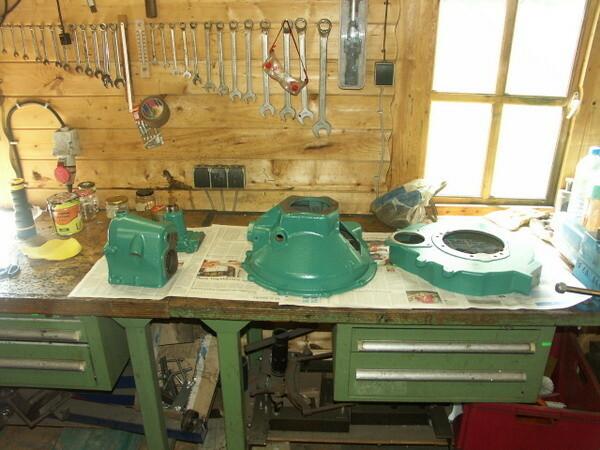 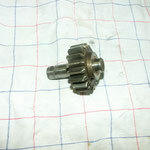 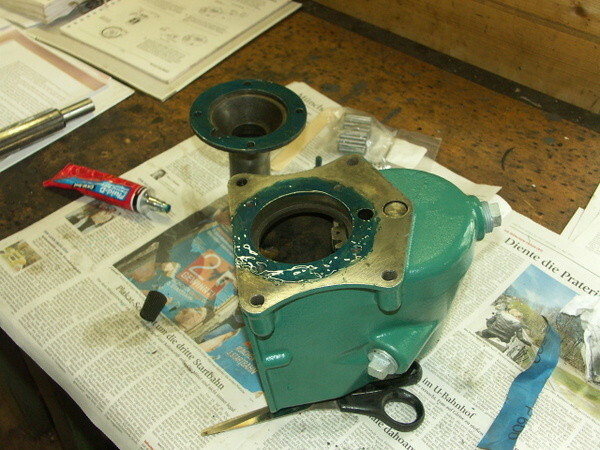 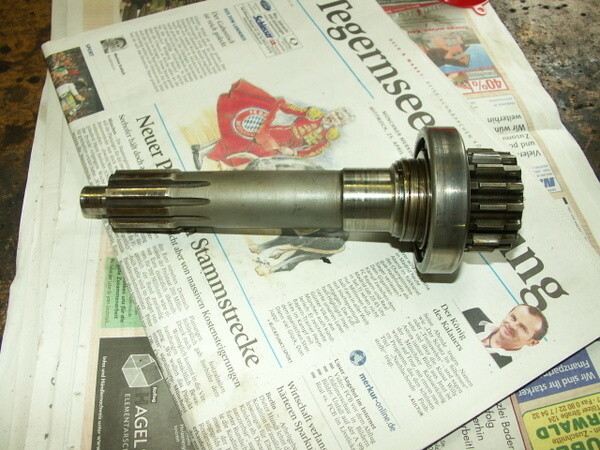 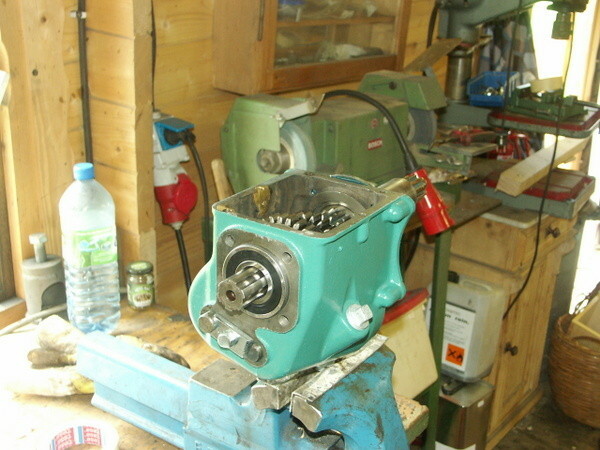 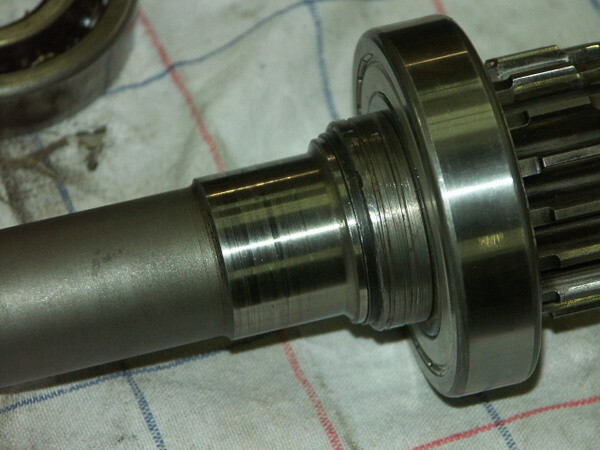 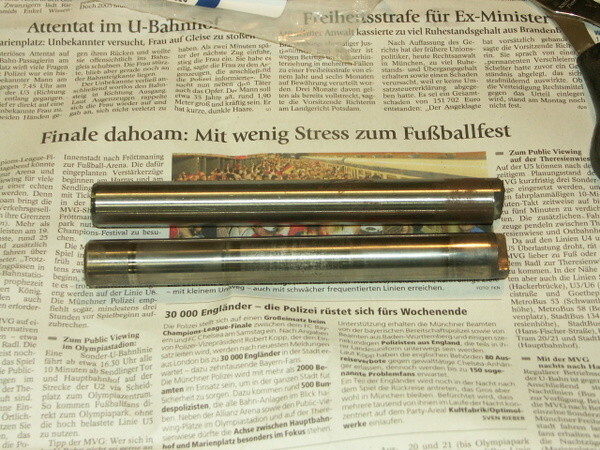 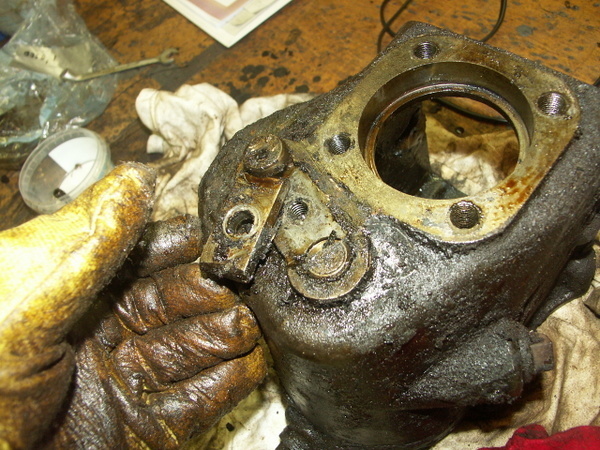 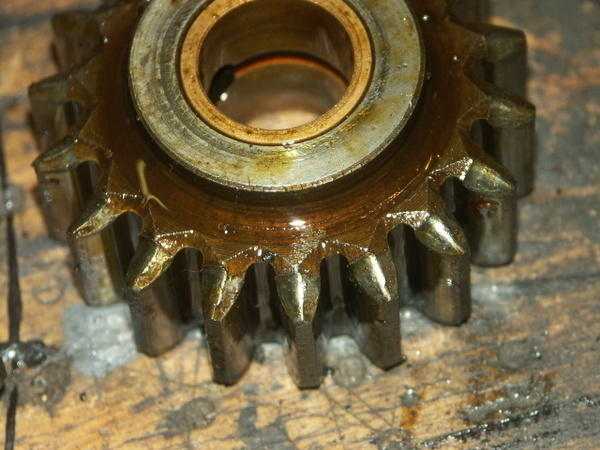 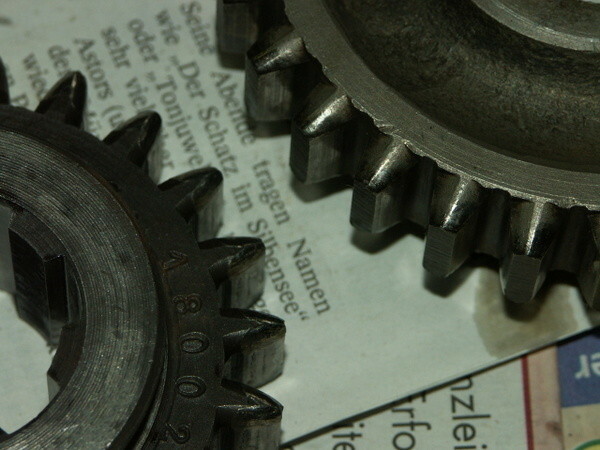 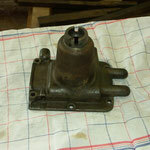 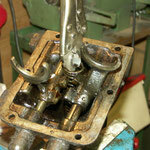 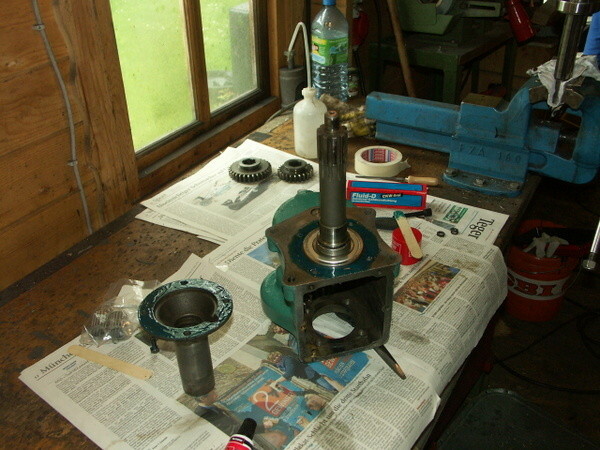 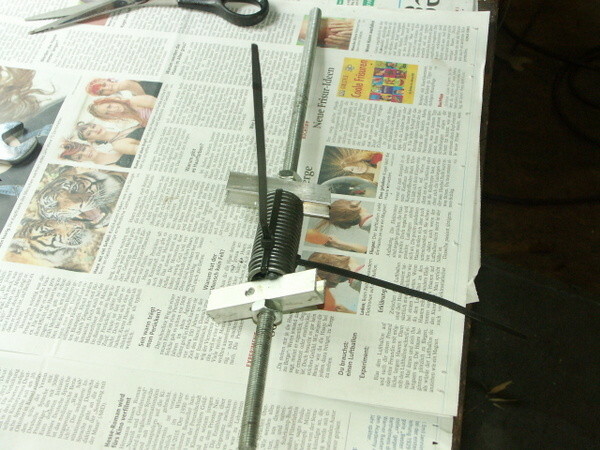 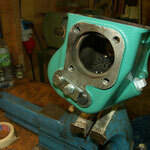 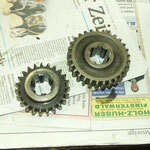 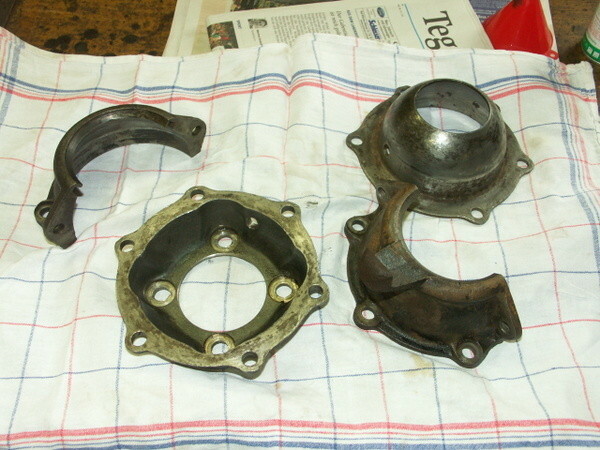 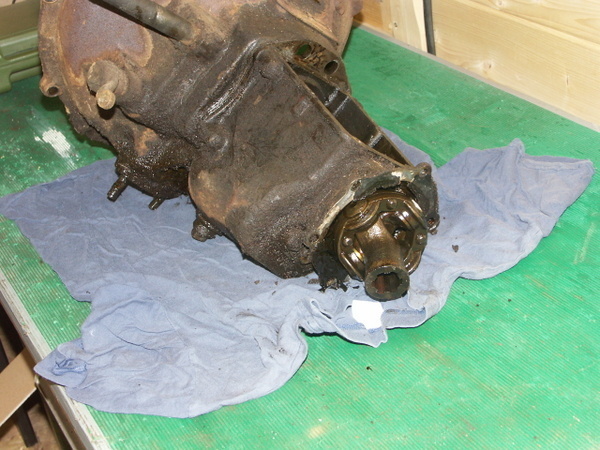 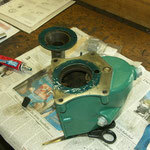 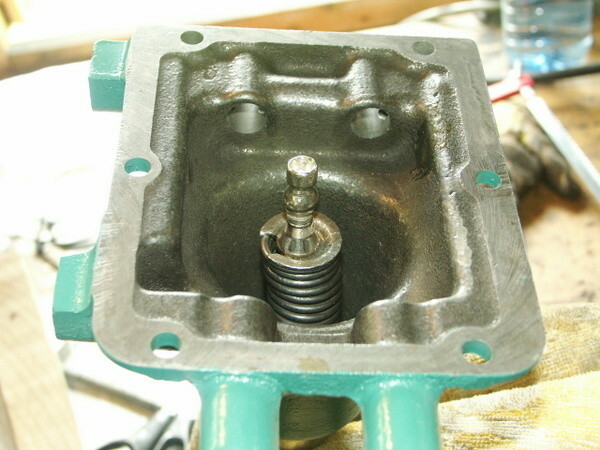 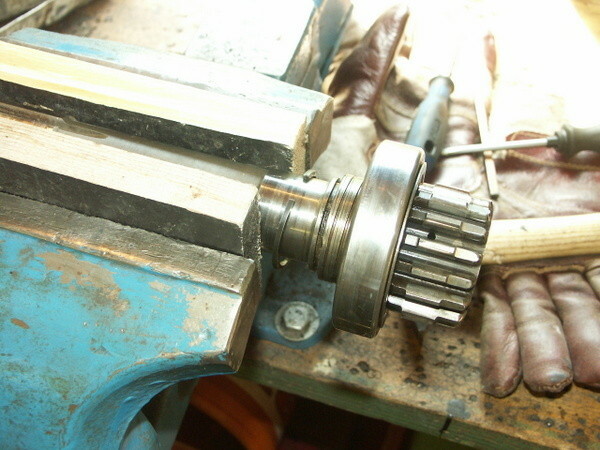 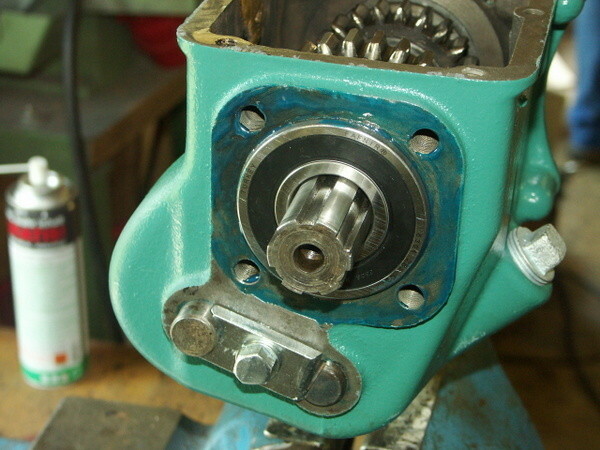 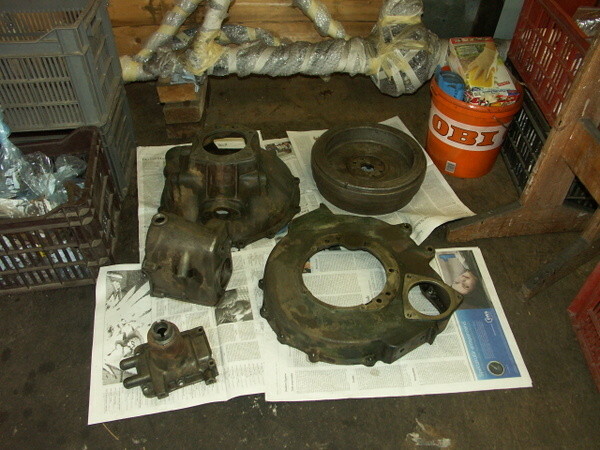 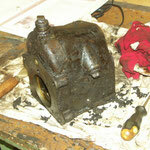 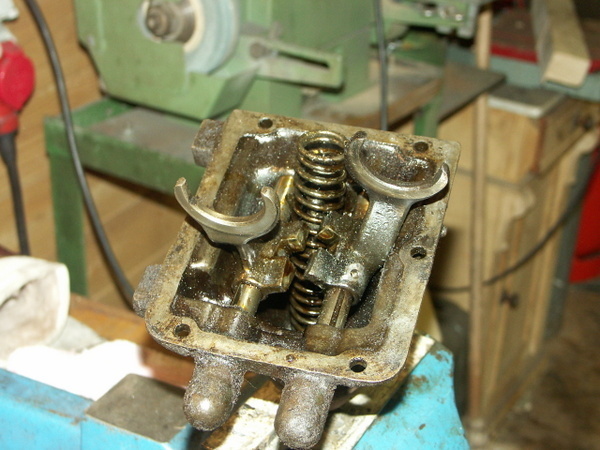 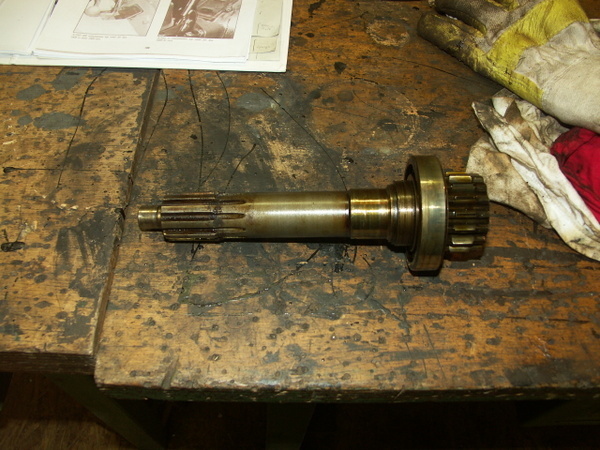 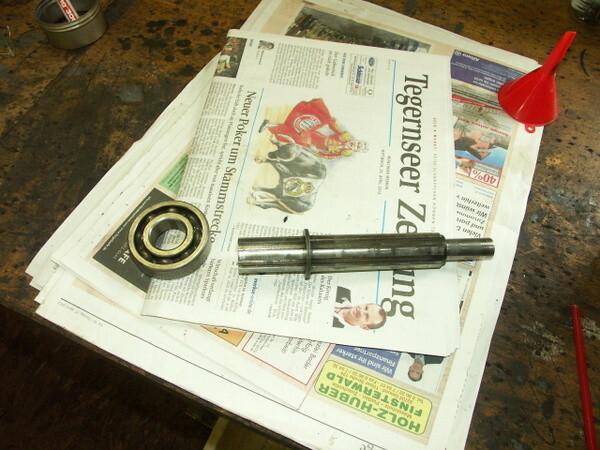 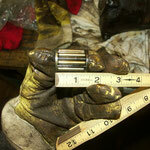 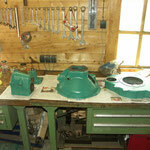 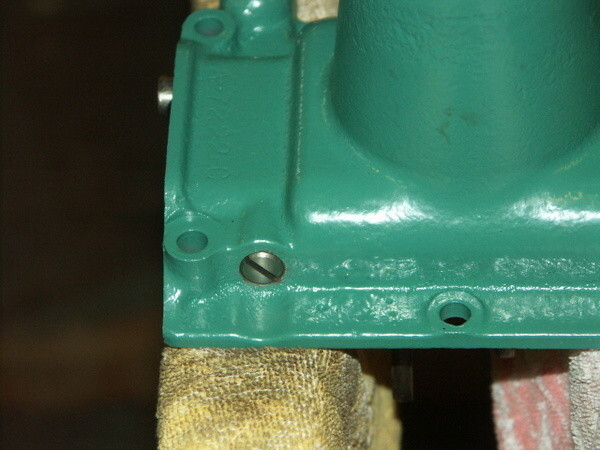 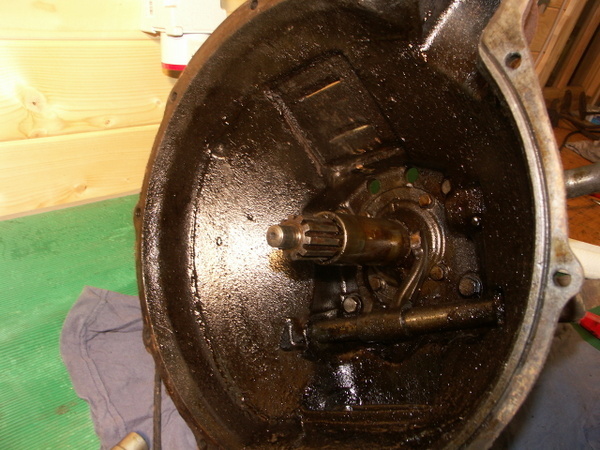 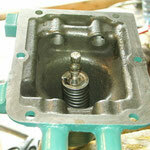 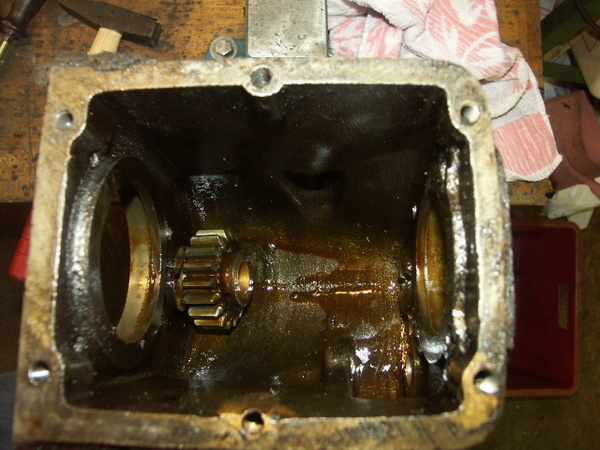 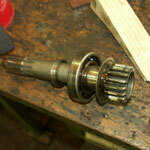 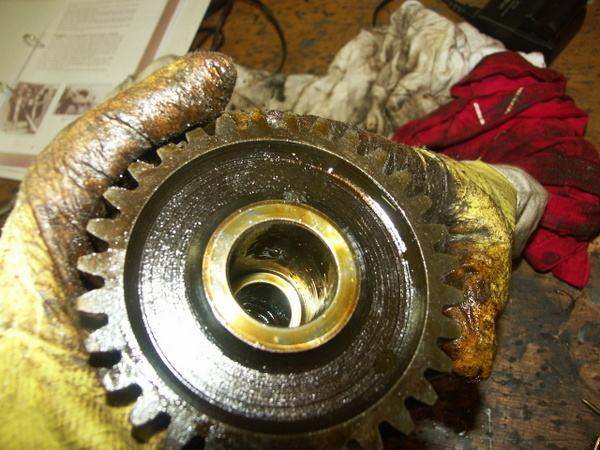 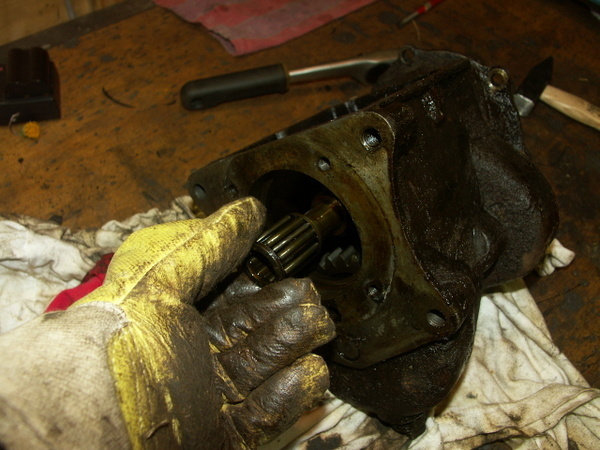 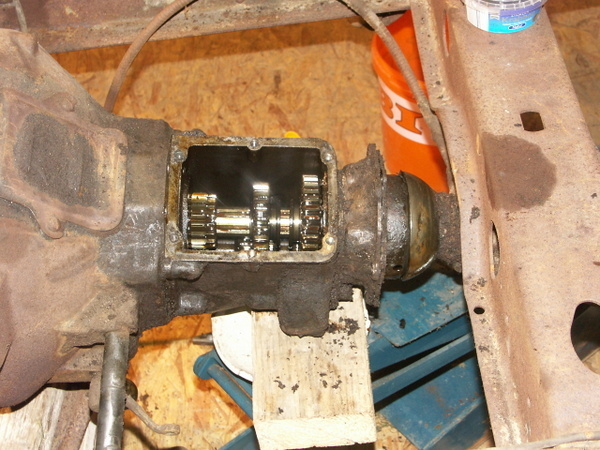 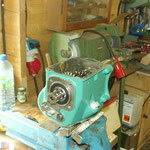 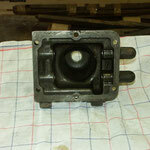 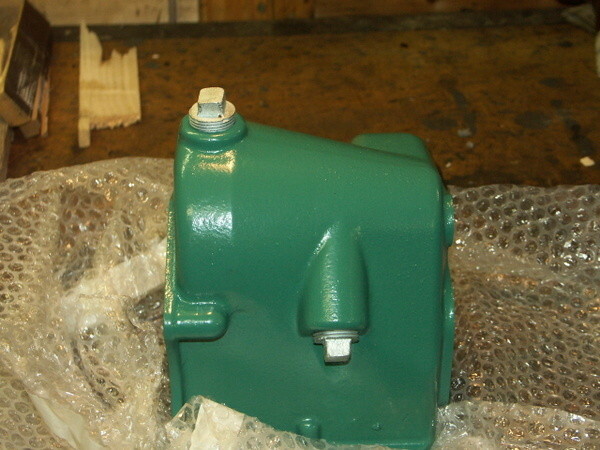 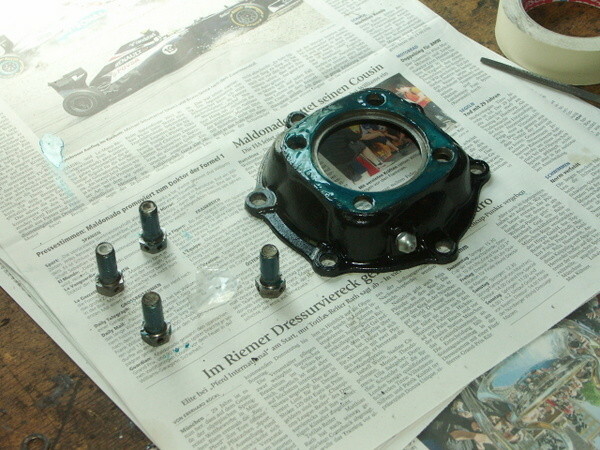 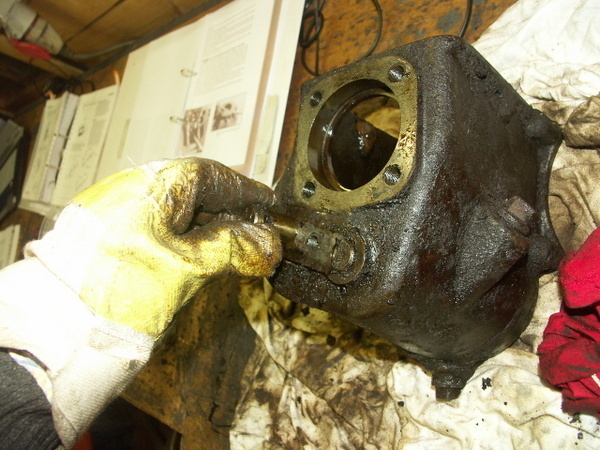 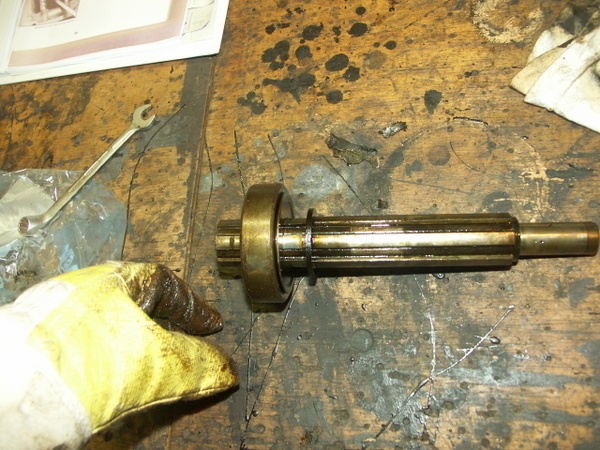 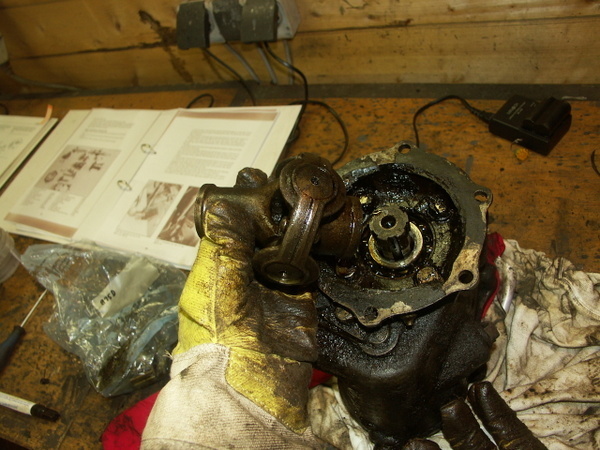 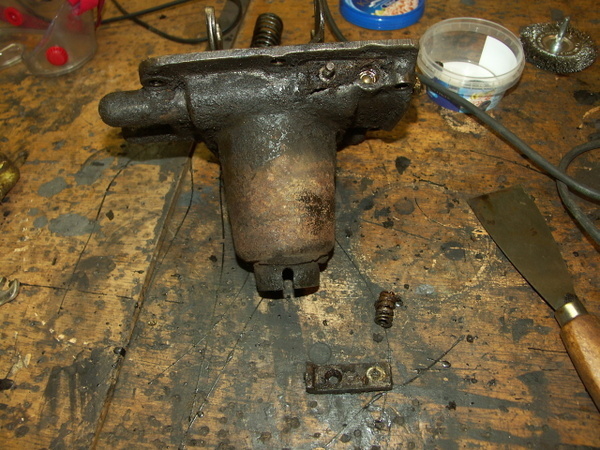 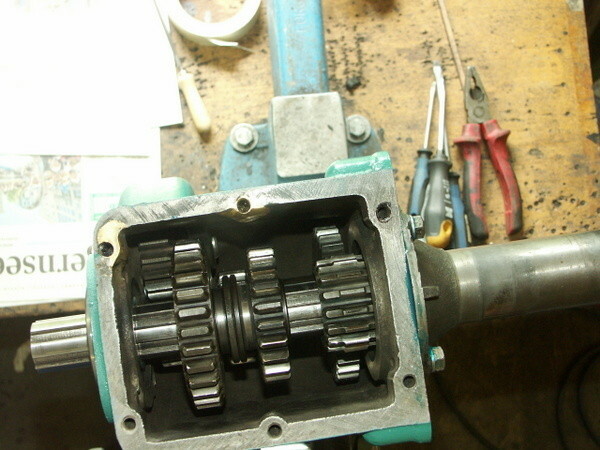 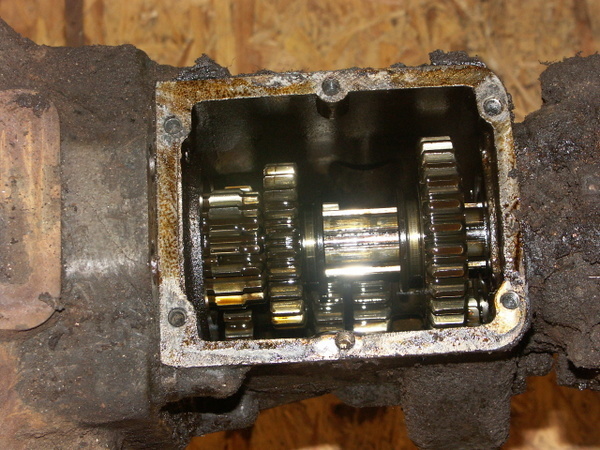 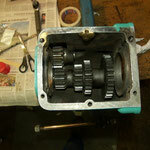 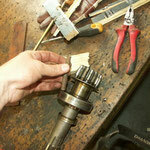 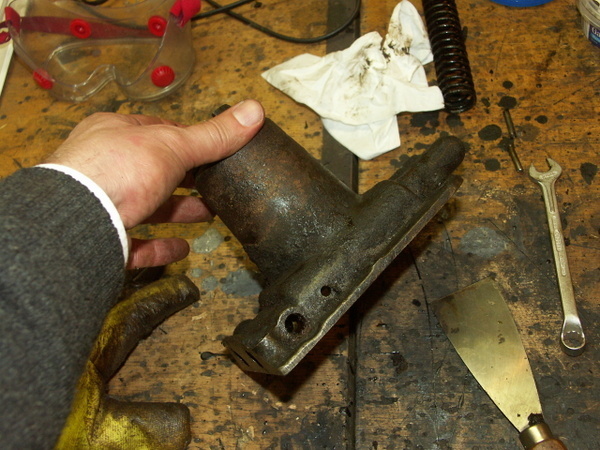 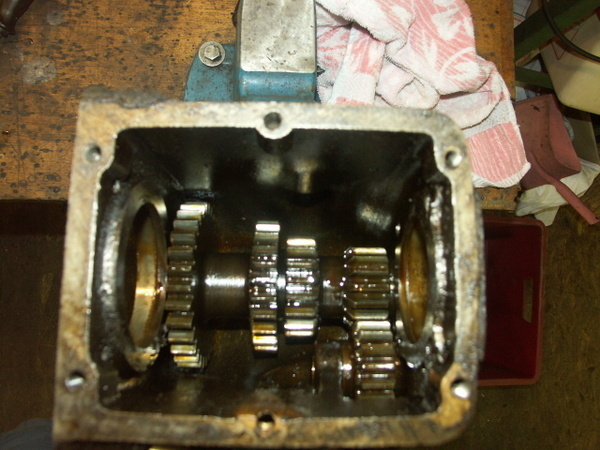 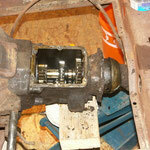 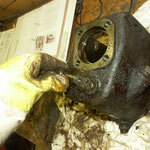 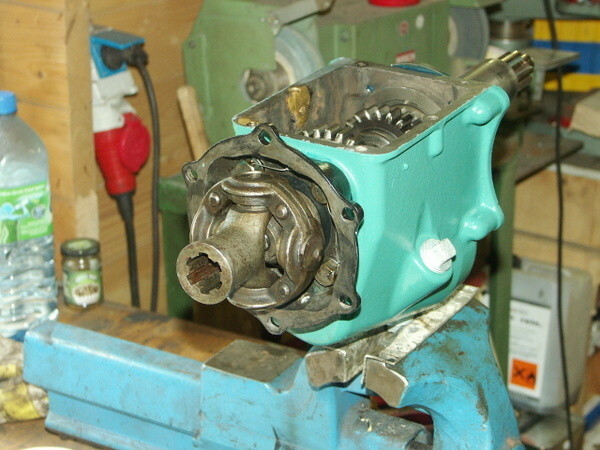 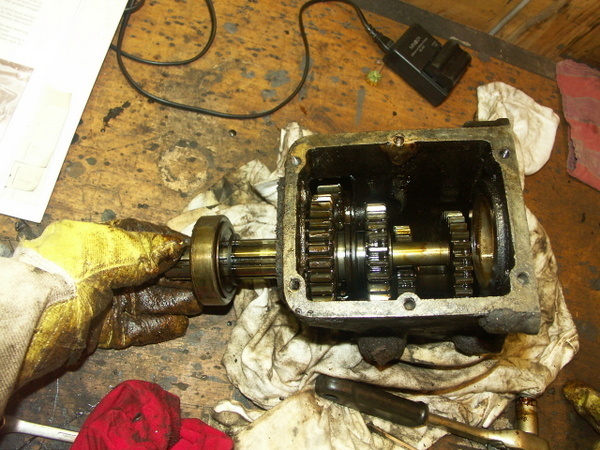 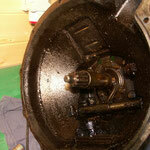 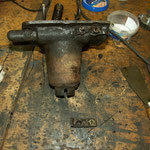 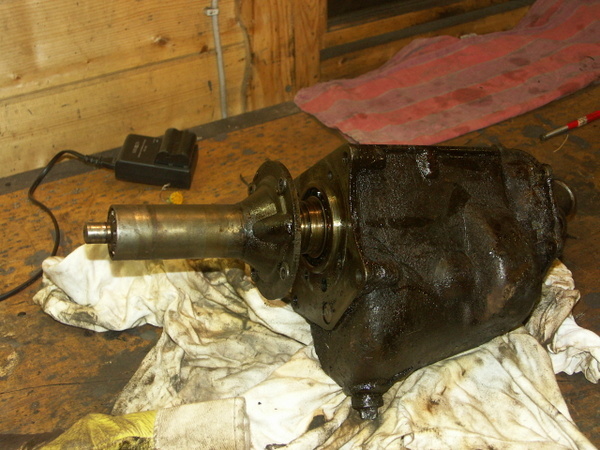 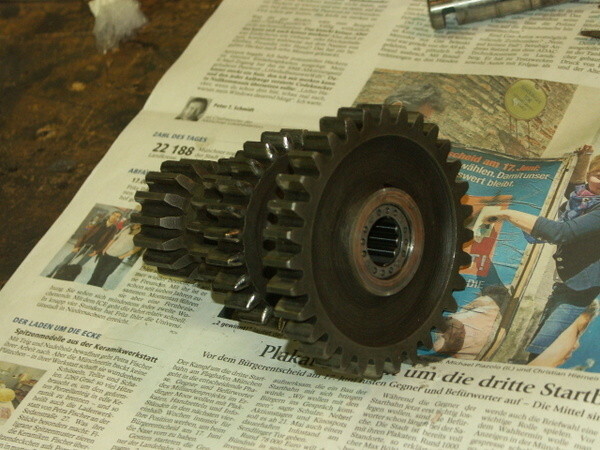 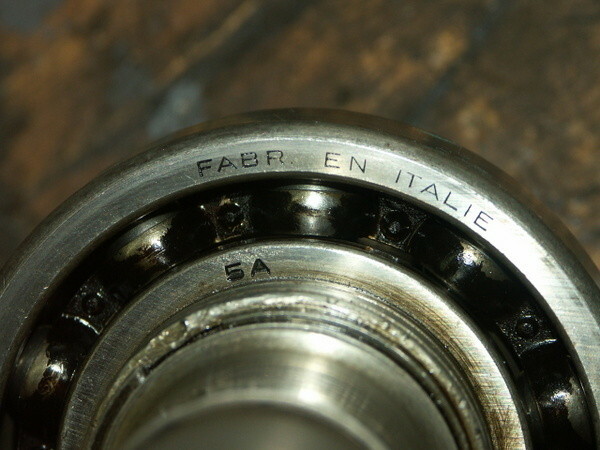 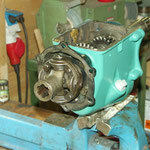 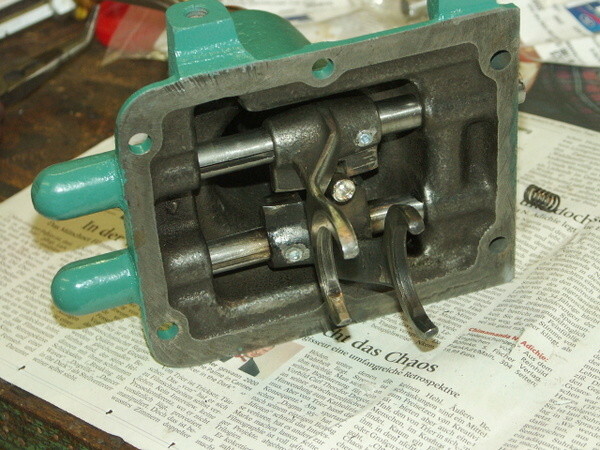 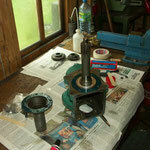 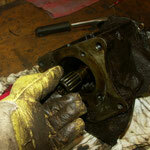 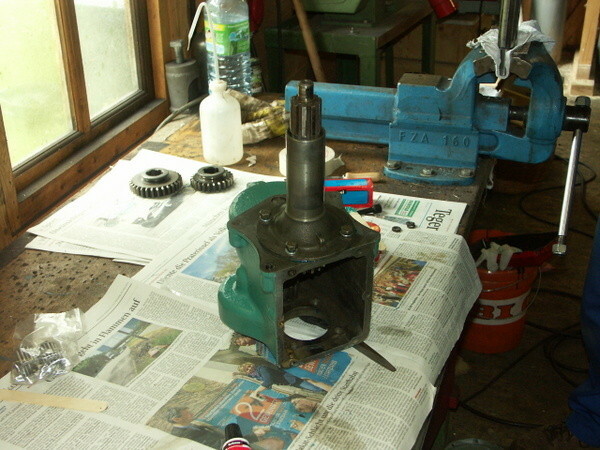 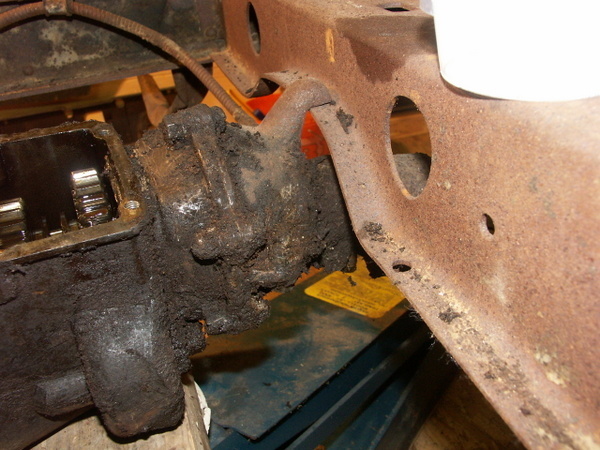 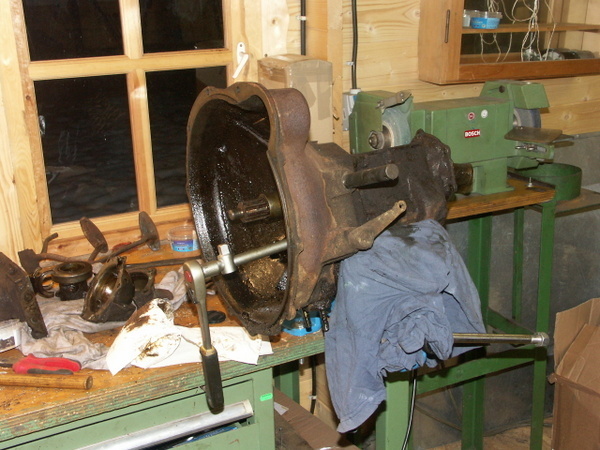 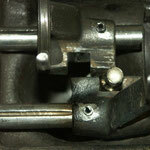 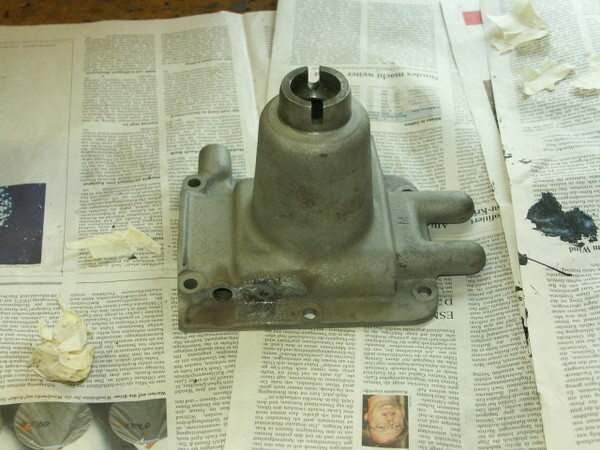 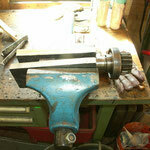 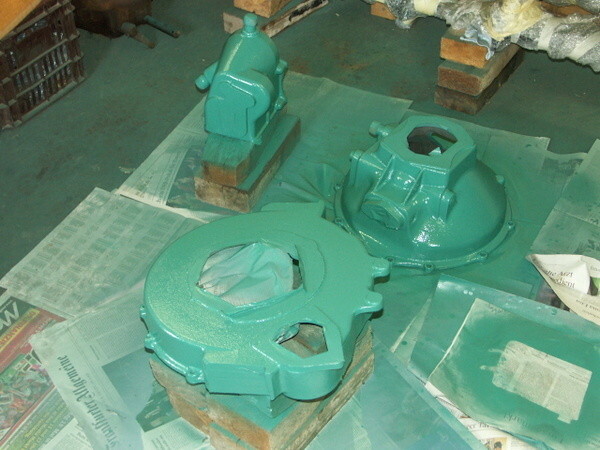 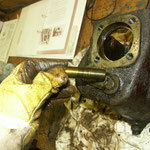 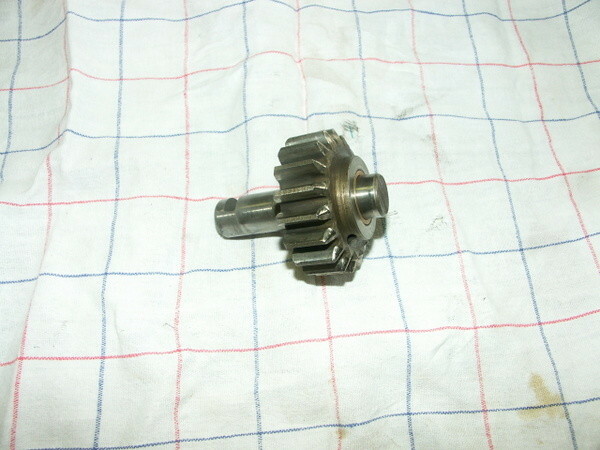 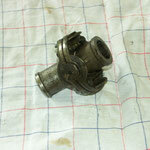 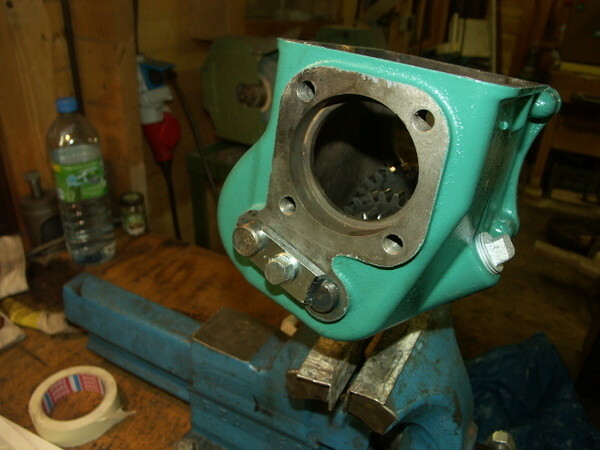 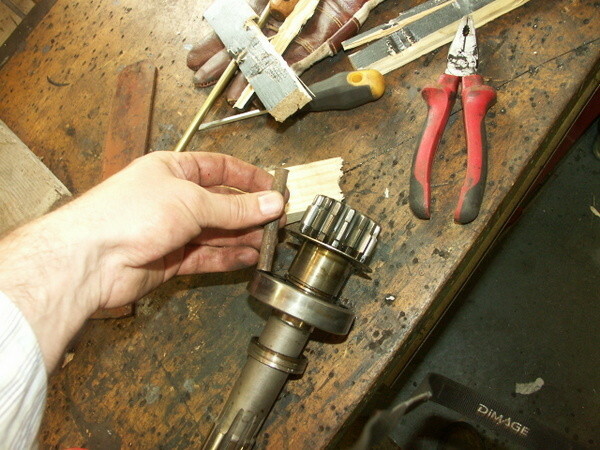 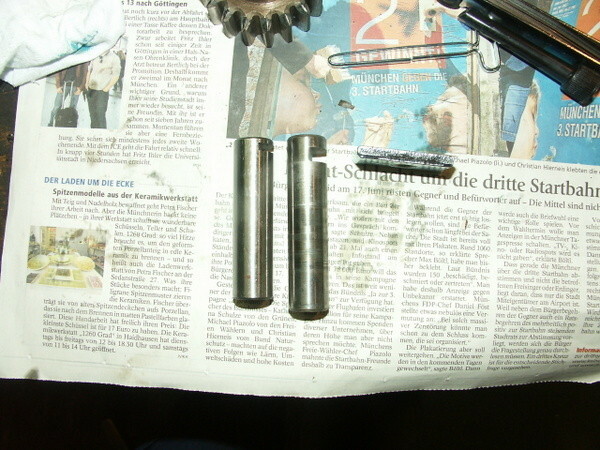 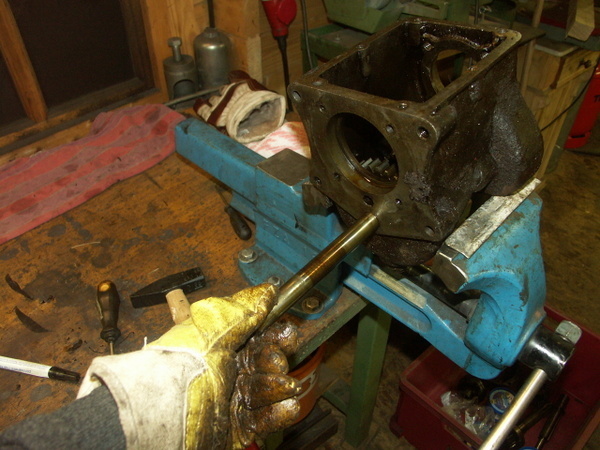 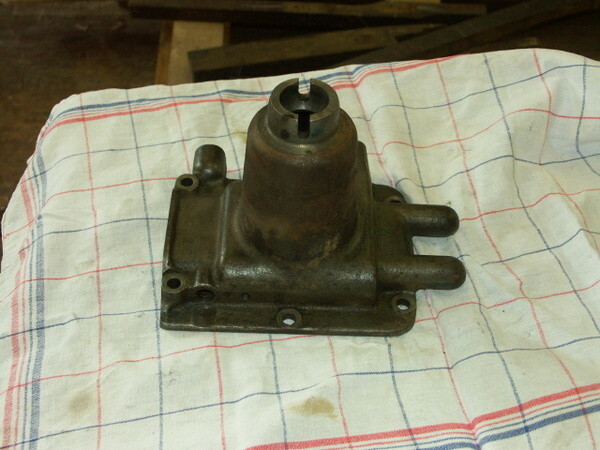 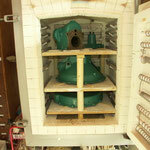 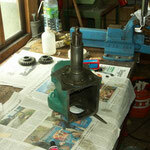 16th June 2012: Transmission finished and reassembled: For the final assembly with the bell housing see "Clutch"